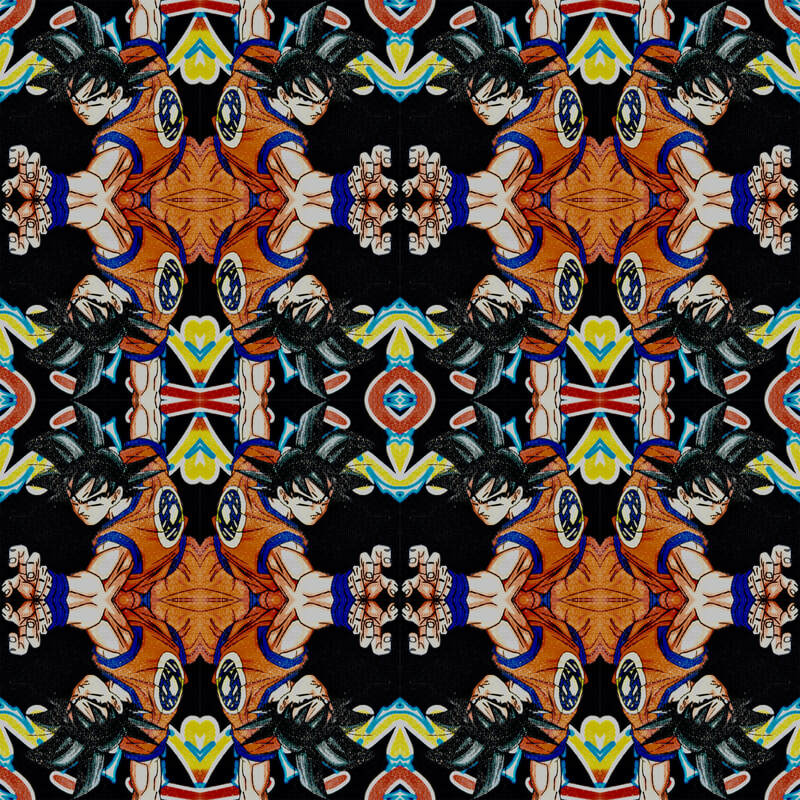 I titled this piece Goku Mandala because it’s a mandala of Goku from Dragon Ball. It’s a picture of my friend’s sweatshirt. I made it with photoshop. I made with the tessellation technique. I like it because of the colors. I like how Goku’s hands touch each other and meet in the middle. I think I am a creative artist. I have learned how to layer in photoshop. I’m looking forward to learning more photoshop techniques. I love working with photoshop. My picture is a portrait of my classmate Vanessa. I titled the picture Sunny because of the bright colors of her shirt and the small specks of sun coming down on her. I took this picture with the help of a reflector. We just simply chose a spot where we would be able to use the sun reflector to reflect it and make her look bright and golden like. I like this picture because of how clean, and colorful it is. She looks very natural and I enjoy how the background is blurred so she’s the only focus in the picture. I would describe myself as someone who likes to learn new photography techniques whenever I get the chance. I’ve decided to titled my photograph “A Step into Nature” because this photograph is located deep in the trails of the duck pond. I used the word “step” because as I was walking on the trails, this area was very closed in and hard to get into, so I had to take one step in and point the camera upwards to get the this shot. I also included the word “nature” because my photograph contains nature, its aspects, and most importantly how beautiful nature is. The photograph I took is of many trees hurled together that makes a circular shape. The sun is also in the photograph revealing its rays. I took this photograph at the duck pond at the time we were doing the Landscape Compositional Rules project. I edited this photo in Lightroom, where I adjusted the exposure (+0.40), highlights at( -12), shadows (-60), whites (-100), blacks (+100), and added dehazed (+100).I really like this photo because it is very bright, detailed, and has an adventurous background story to it. When I show my photography work to friends and family, I always show them this photograph because I am really proud of the way it came out. My best friend really loves nature, once I showed him this photograph, he instantly fell in love with this photograph and now it’s his lockscreen on his phone. I would describe myself as an artist because I get a clear picture of what my subject is and I make sure there is no distractions, blurs, or errors in the photo. This year I have learned how to use a professional camera, the features of a camera, elements like leading line or texture, and how to use photoshop. I’m looking forward to learning more about the app photoshop and its tools, also I hope we get to do more light painting or pictures with the ring light. This is a picture of my friend Brooke during golden hour. I titled this “Honey Eyes” because The way the golden sun glows on her eye, it reminds me of honey swirling around in a cup. I look this picture on my Canon PowerShot SX40 while waiting on the bus to leave from the Vista christmas parade. 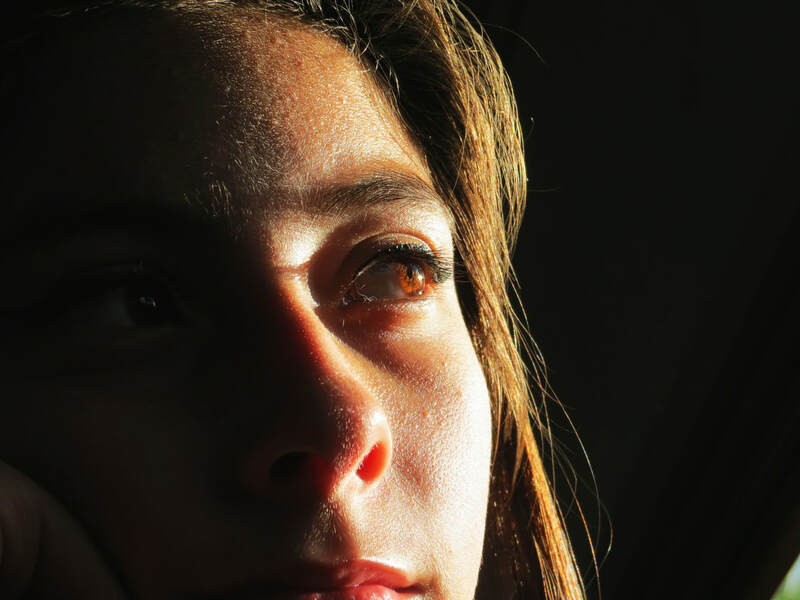 I like this photo because I love how her eye just glows against the sun, and intensifies itself. As an artist I like the focus of my works to not be the main picture, but I want the thing you expect least as the focus. In this one I kind of did the opposite with her eye having it be the brightest feature. 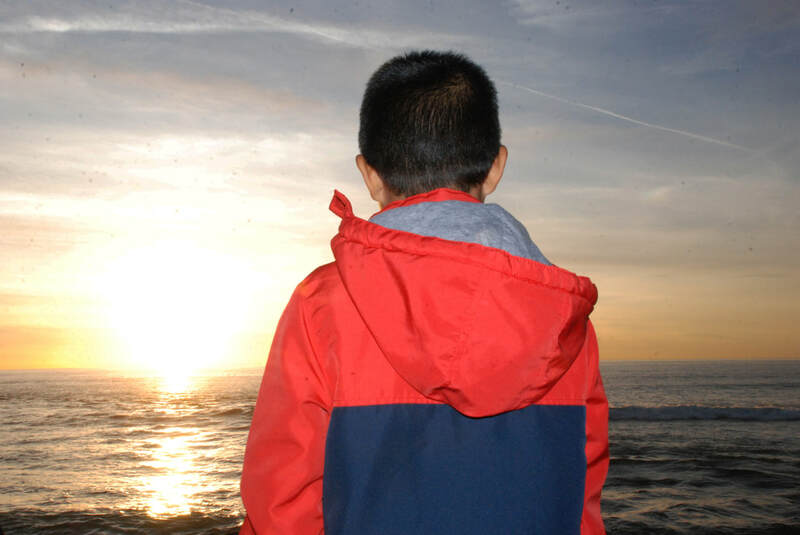 I titled my photograph Memories because when I was about the age of my little brother my mom and I would always be at the beach walking or just sitting down and watch the Sunset by the rocks at Carlsbad, Ca.The photograph is of my little brother standing by the sun and facing the ocean. What I did to make this photograph look like that is in photoshop I just decreased the brightness to-106 and increased the contrast to 44 and I also went to Carlsbad, Ca and it was by the Highway 101 heading to Leucadia, Ca by the rocks. I like this Photograph because just by looking at my little brother and going to the rocks by the beach makes me remember all the memories I have of my mom and I while my dad worked. I think it’s a successful photograph because the photograph exposes the natural beauty . I would describe myself as capturing the natural brightness. What I’ve learned so far this year is how to change the exposure and focus on the main object. I’m looking forward to learning how to focus on the background when a person is standing in front. Avery Morton, Class of 2019, Bright. 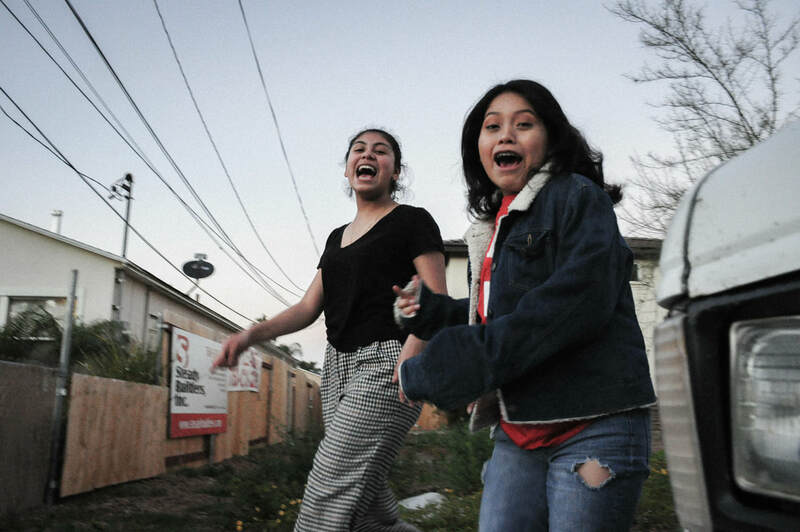 My picture is titled “Bright” because in the center of a picture is a girl named Geo, and she is so bright and lights up the room wherever she goes, she has a bright personality and laugh. This is a picture of Geo looking off into the distance where her friends are walking up to her. How I made this photo was I used photoshop for my layers to do selective colors, first I turned the image into black and white and then I added a layer so I could use the paintbrush tool to bring back the colors that I wanted for this photo. 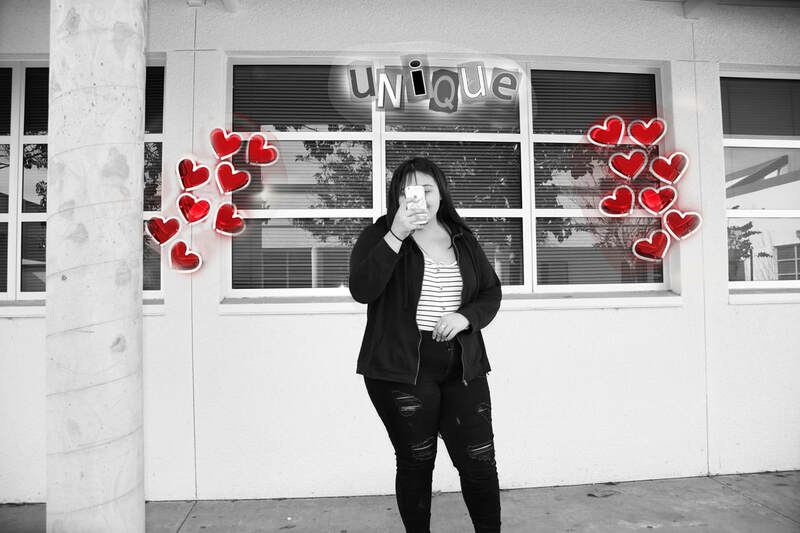 I like this photo because it shows how bold, and beautiful she is, it shows how she can stand out in a picture and seem to be the only thing you see. This picture is so beautiful, I think that it show how beautiful, bold, spontaneous, bright, and how wonderful, she is. I think this photo shows how far I have come in this class because I would edit photos so much that it was almost like they weren’t real photos anymore, but know they are more natural and I love how my pictures look now rather than from when I first started. 2. Why you have titled that photograph that name? 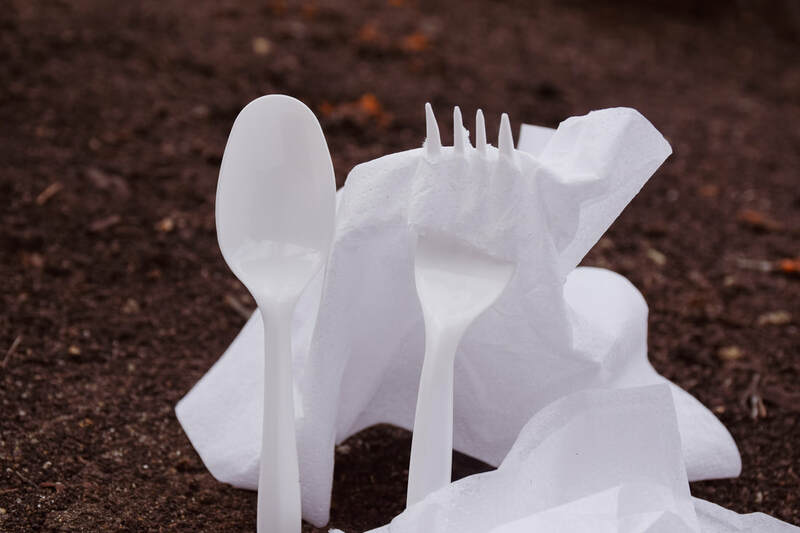 I titled it “Just Married” because it looks like the the spoon and fork, who are married. Are posing for the picture. 3. What is it a picture of? 5. Why do you like it? How do you think it's a successful photograph? I like it because it reminded me of getting married in the future with my honey bunches of oats and the photo itself looks beautiful, at least to me. I thinks it’s successful because it’s more a creative piece then an environmental piece, where the subject need need to be adjusted and positioned in order to take the photo and to make out what it really is. 6. How would you describe yourself as an artist? What have you learned so far this year? What are you looking forward to learning? Usually when I'm not at school taking the pictures, i'm out with my one and only model who either lingers with me or models for me to take the pictures. I usually take environmental photos of cities, or restaurants(mostly outside instead of inside) and pictures of her whereas she models for me or she’s just their. Asides from that I have learned a lot from practising my own pictures and doing the assignments that have help introduce more in depth into photography. Im looking forward for more pictures that have a fashion and surrealistic feel to it, I would like to improve more in my editing as well. I titled my photograph this because as you can see in the sky, it is pink, blue and purple like cotton candy. It is super pretty.The picture is of my boyfriend, Oscar walking in the sand towards the ocean in Coronado Island. To make it I added filters to make the sky more fluorescent and stand out more. I also made the horizon level. 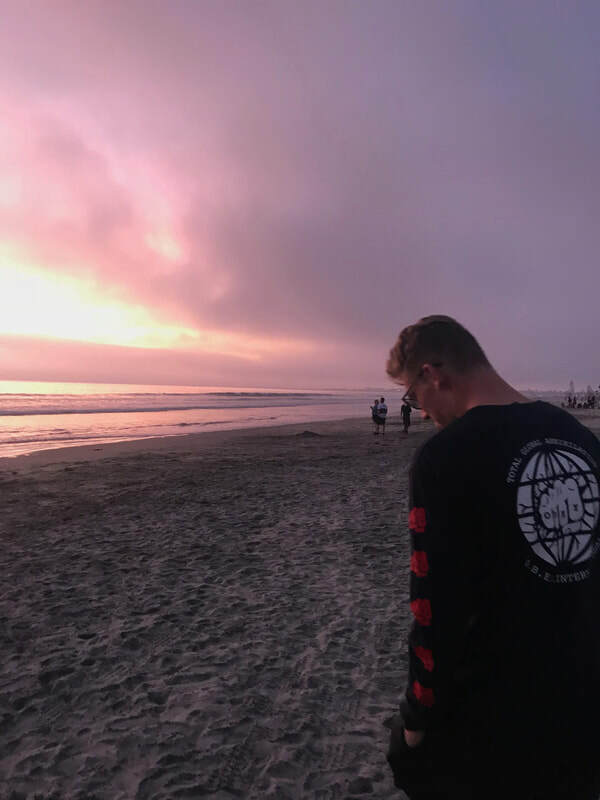 I like this photograph because of the colors in the sky and that it was taken at the beach, especially with my boyfriend in it. I think it's a successful photograph because the movement in the photo. I would describe myself as an artist as very bold and colorful. I like to capture moments that are fun and quirky. A picture that has a memory held in it as well is what I tend to go for. My picture is an HDR photograph taken on my iphone 8 plus. I titled this photo “ Coffee and Sand” because I took this photo in carlsbad village right outside the starbucks and I have many great memories at the beach with my friends and getting coffee. To edit this photo I used the app “Lightroom” on my phone to change it to black and white as well as crop and level. I messed around with the lighting and exposure to create the perfect black and white. I love this photograph because it showcases the type of photography that I enjoy shooting which is street photography and documentary photography. I enjoy using black and white in my photos because it creates a calm mood and it allows certain light and shadows to be seen differently. I believe this photo is successful because it showcases me as a photographer and how I like to create my photos to make people feel a certain way. 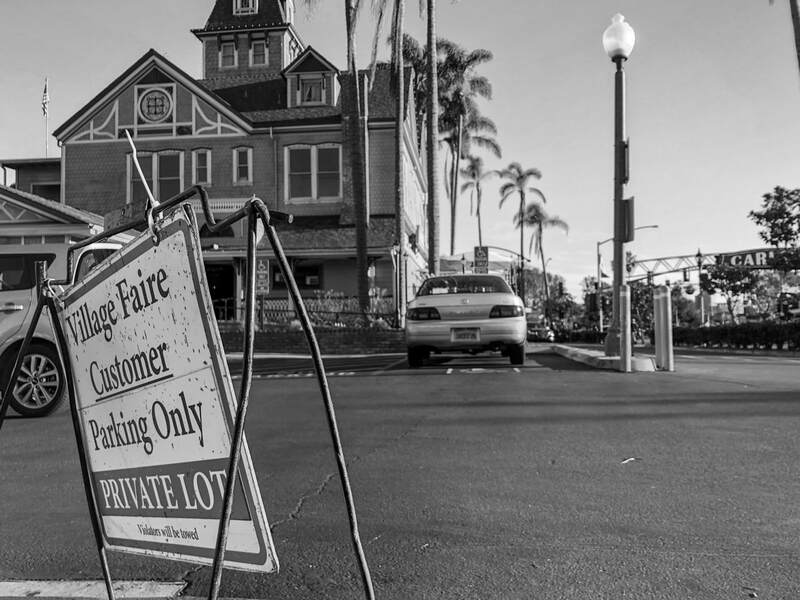 This photo allows carlsbad to be seen in a different way as well because when you go to the beach people usually just take photos of the ocean or palm trees and I decided to take a photo of a sign in a parking lot. I guess what I am trying to say is I have a different eye for photos and I hope you enjoy it as much as I do. 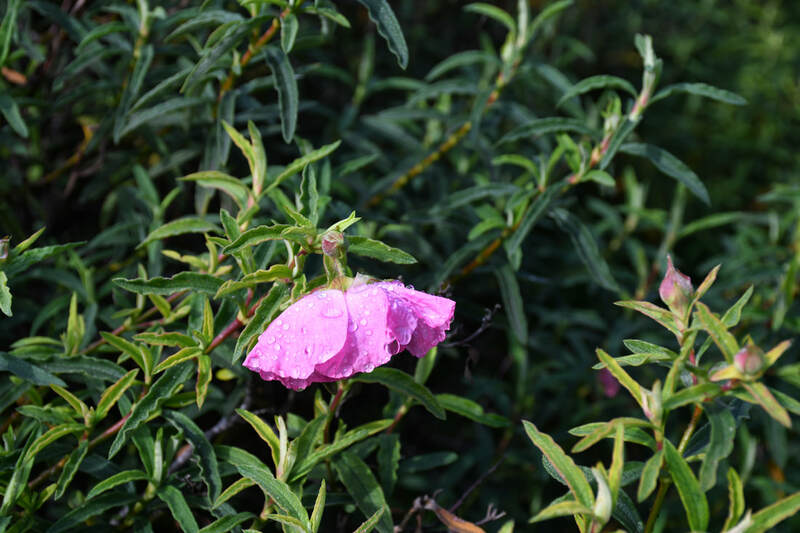 My picture is a photo of flower in the more in the bushes near the football field. The reason i had chosen this photograph is because i am newer to this class and this is one of the first picture i had taken. I really enjoy how the water looks if the picture, i haven’t perfected take picture but as a go along im sure ill get better. My picture is a close up shot of a dandelion with a macro lens. I titled it “Dandelion” because its a picture of a dandelion. In photoshop I only changed the highlights, shadows, and the exposure. 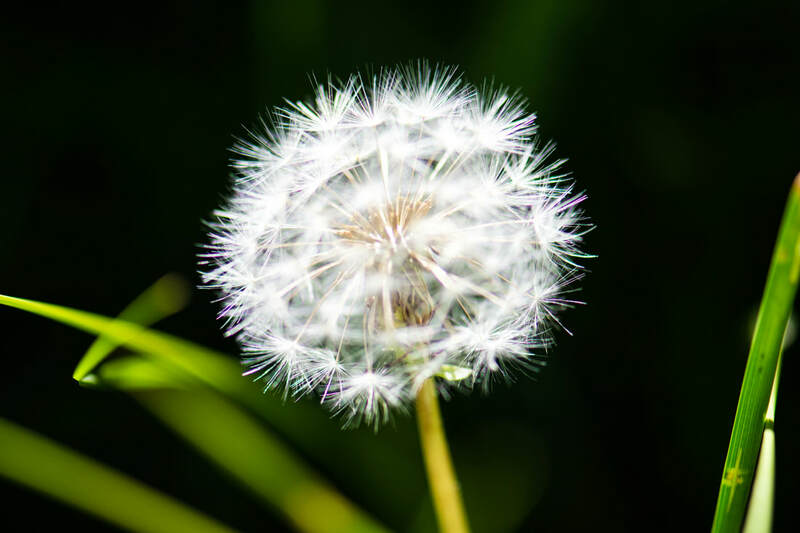 I like this photo because of how simple it looks.It shows a up close photo of a dandelion and its structure. I also like how still the flower is. Usually in pictures of dandelions people are blowing the petals off but in this its still in its perfect state. My picture is a crop photograph at te Duck Pond. I titled this image as Best Friends because the ducks are just resting and enjoying there home “ The Duck Pond” which shows how they are calm even when I was close up. What I did to achieve this photograph was getting as close as possible to the ducks without scaring them. Once I was close enough I zoomed in white camera lens and tried to get as much detail of the ducks feathers as I could. 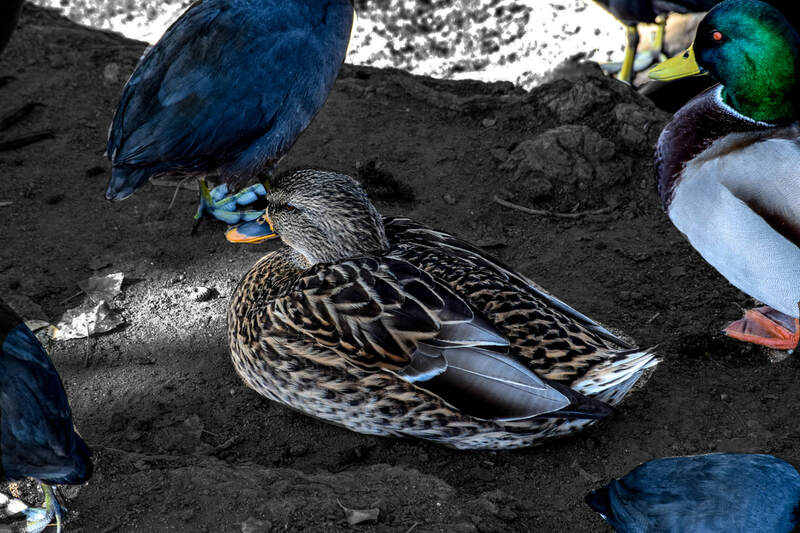 After that I edited the picture on lightroom giving it amore bright color to the ducks feathers especially the ones with cool patterns and the bright yellow beaks. The final step was using selective color in Photoshop. I sent the background as the darkest Black and White without making the picture have to much of a shade. Then I made the ducks have color and the rest to be Black and White. I like this picture because it shows the nature of the ducks. I think that this will be a successful picture because of the details and pattern of the ducks feathers. I would describe myself as an artist as creative, peaceful and colorful because that's the main thing mst of my ideas come from when taking a picture. I also have learned many new thing by taking Photography, I believe that this will help me later on if there a special occasion now I know what Aperture, Shutter Speed and ISO. I forward on learning more techniques and different ideas of photography. 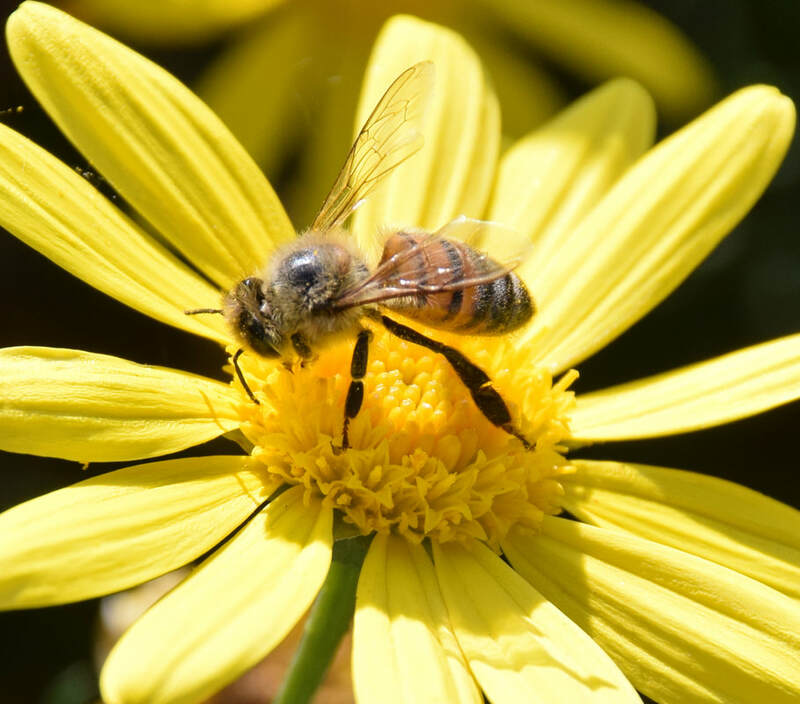 My photograph is of a bee on flower. I titled it “Nature” because the photograph is just of a bee doing its job and just watching the bee was peaceful. I took this picture at the football stadium. At first I was just trying to take a picture of the flowers but then I saw the bee and right away I thought capturing the bee on the flower would be more interesting. I quickly tried to take the picture but the bee kept moving from flower to flower so I kept running after it. I tried not to bother it by getting to close and when the timing was right I took the shot. To create the perfect image I first duplicated the layer. Then, I went ahead and turned the image black and white. After that, I created a layer mask. I used the paintbrush tool to get the original color to show in the places I wanted it. My artistry has improved since the first time I used one of these cameras and once I got the hang of it I think my photographs look pretty decent. I want to continue learning different techniques so I can improve for the future. I titled my image “Fierce” because of the abnormal attitude that the pigeon portrays. We usually think of pigeons as birds that are afraid of humans and harmless creatures in our society. However, the pigeon in my photograph is extremely bold and fierce as if it were an eagle diving down on a prey. The photograph is made of two pigeons, one being the prey and the other imitating an eagle. 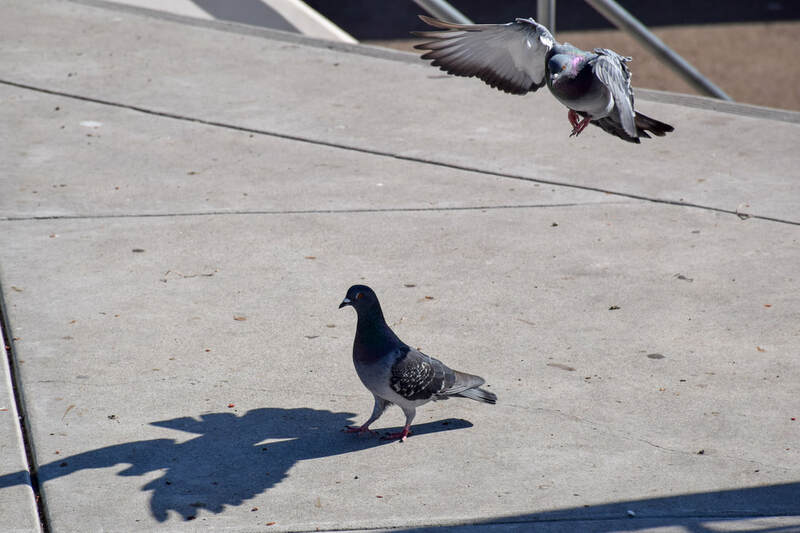 One pigeon is casually walking and the other is diving down as if it were about to strike with its claws. I did no type of editing to this image. I really liked how the pigeon’s feathers shined with the sunlight so I left it as is. I like this photograph because of the amount of detail and action captured. I believe it is a successful photograph because I was able to capture such a fast moving, action packed pigeon and still able to capture the immense amount of detail in the pigeon’s feathers. I have learned so much in terms of creating and putting together the perfect image. Choosing the perfect location as well as the perfect setting is very key to getting the best photograph. I have learned how to manage and control a camera in order to compose the desired photograph. Having control over the camera such as changing the shutter speed or adjusting the aperture are examples of key factors in taking the best photograph possible. I titled this picture the “Web of Amazement” because the picture of the spider chowing down on his food is something you don’t see everyday and is no doubt something I was amazed about. This picture of the spider eating his prey is something I’ve never seen in person before and was a once in a lifetime moment for me. Seeing the texture of the spider up so close you can see his hairs and the colors on its back is a good detail I got in this picture. 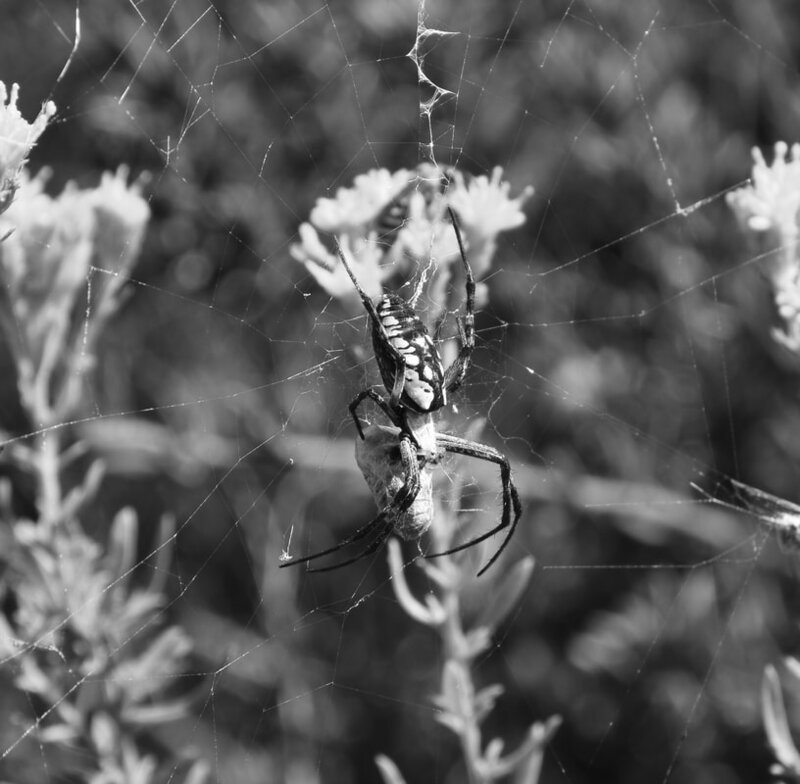 To take this picture I used a black and white filter and had to crop on the spider more. It was taken near the duck pond in the middle of the day. This is my favorite picture of the year because I’ve never taken a picture so close up like this and I really like how the detail came out. I think it’s a successful photograph because of how the detail of the spider and his prey really pop out. If I’d describe myself as a artist I say creative, cause if the different picture I can create. I learned about the principles of art and how you can take pictures in many other ways then just straight. This semester I hope to learn more about angles and lighting of a picture. I titled this photo as “Pride” because the lizard in the photo looks like it’s holding its head up high and the way that its mouth looks like it curves up into a smug smile perfectly perfectly fits the description of one who is prideful.This photo is of a lizard that just happened to come by on a tree over by the duck pond.I took this photo at f/11, 1/250th of a second shutter speed, ISO 400. I didn’t make any edits to the photo other than turning it to black and white using photoshop. 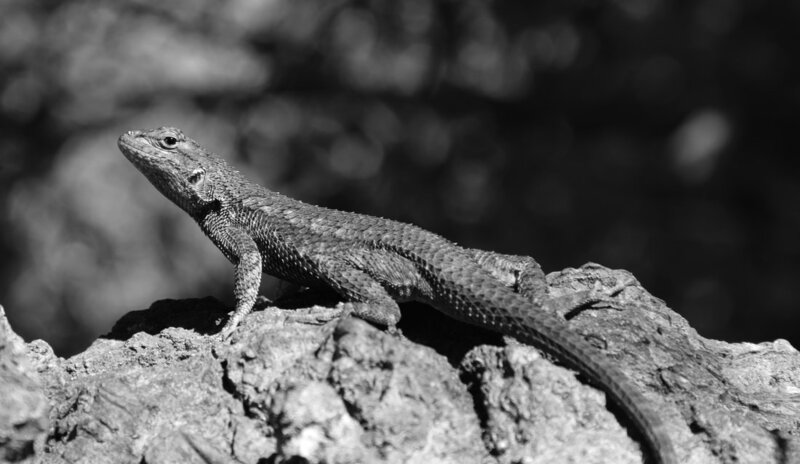 I like this photo because of how much detail you can see on the lizard. 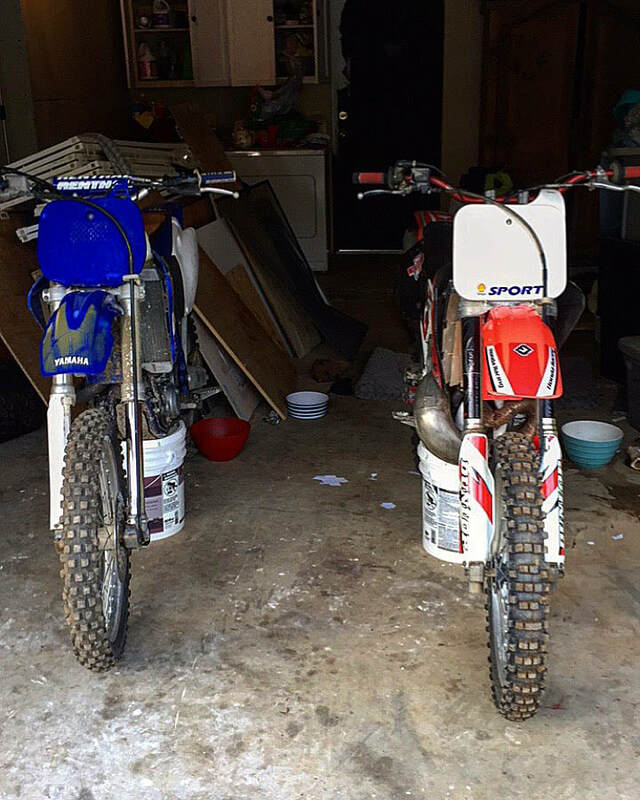 My picture is an HDR photograph of two dirt-bikes making a picture. I titled it “Dirt-Bike creation” because there are two different dirt-Bikes that create a great photograph showing two object that are the same but are also different. To make this picture I took the photograph from my gallery and added contrast and cropped it so only the bikes took up the photo.My photography picture taking and editing has improved a lot in this year. My picture results were undulating from good to bad and so forth but once I began to put my mind to it this semester I decided to take my skills to another level and show this picture which shows my favorite hobby in one photo. This photograph was taken behind a Food For Less. 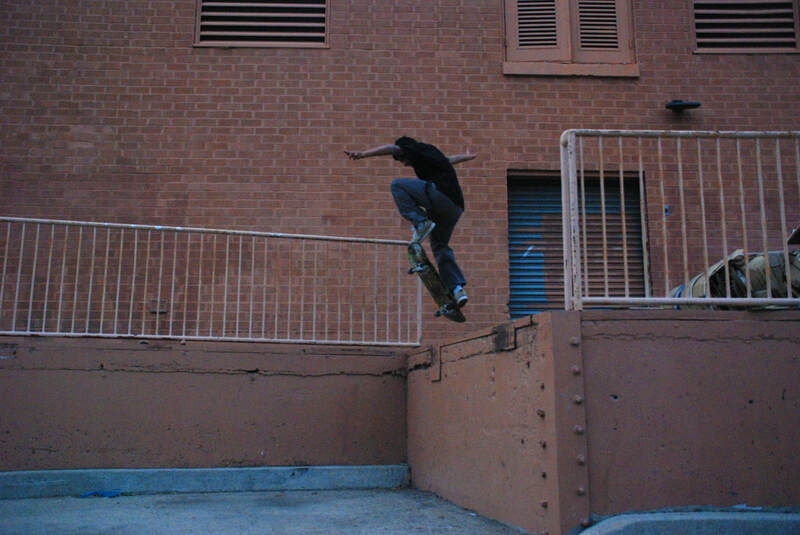 The reason why I titled this photograph Caught In Action is because in the photograph my boyfriend was caught in action doing a trick. I took this picture with a Nikon camera and I used photoshop to make the picture more brighter. I like this photograph because when it comes to capturing the moment while in action, it’s just so nice to see the facial expression whether he was going to land and make the trick or not. What I find successful in this picture is that I got to capture his moment, in mid air getting ready to land it right. As in artist, I would describe myself as a learner, my pictures aren’t that good yet but I tend to learn more about it and open more doors and be creative with the opportunities that come my way. I have learned so many things this year but what I would like to learn more on is the elements of art. Hello, my name is Alberto Gomez and my piece that i want to submit for the midyear gallery is a photo that i named “ World Underwater”. I titled it this because you can see a reflection in the water of the clouds above as if i was staring into another alternate world, and you can see the bright clouds and some of the sun shining down on the puddle of water. It is a picture of a water puddle after a long rainy day, when the sun is peeking through the clouds. The water is clear, there are clouds and the sun is shining down on the water to give it a mirror look. To make the image and take it. I looked for the perfect puddle that would reflect the sun and some bright clouds on top. Then i took the image and uploaded it to photoshop and changed the hue to give it a more blue-ish tone to the image. I made sure to capture the details of the water particles and bubbles. To make the image pop. I enjoy it because it seems simple and boring, but you can see the fine details from water particles to the ripples in the water. As an artist, i would say that I have a very simplistic style of art. I like to have one subject, nothing too crazy, but getting every detail to bring out the beauty in said subject. I am looking forward to getting more in depth practice with photoshop and getting better with it. The reason why I named my photograph " Rise & Shine" because of everyday going to school, you gotta rise up every morning to get this education and learn it to the fullest. As for the shine, Is to stand up for how far you come after years of studies and tests after test. 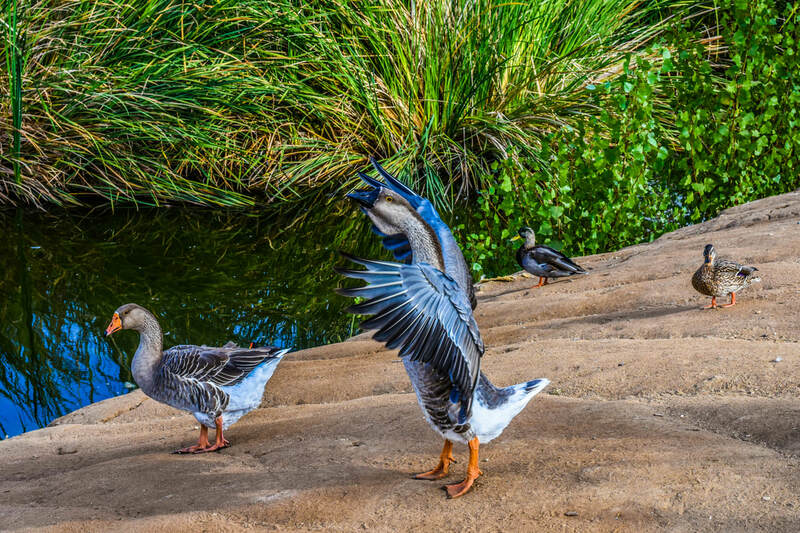 This is a photo of a goose spreading its wings, I took this picture because I thought it was a great pose that the goose did, and I don't always see this kind of images from gooses. All I did in photoshop with this picture is that, I just messed around with the colors to really show more details on the goose's wings. I really like how this photograph came out because of how it looks like the goose is showing off his wings. I rather describe myself more as an editor than a photographer because I seem do understand for about editing in this class than photographs, it's probably because I enjoy editing this amazing photos than to be taking them. I look forward to learning more about editing and taking photographs. I named this photograph “The Mesmerizing Sunset” because this sunset looks very magical and is a very soothing picture. This photo was taken from my Iphone 7 and I used the app Pixlr to edit the photo. 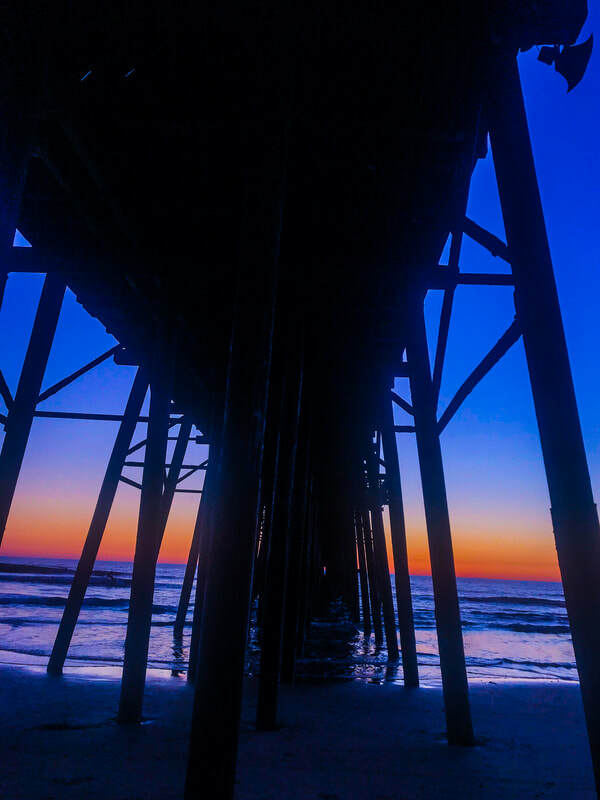 This picture is of a sunset underneath the Oceanside Pier and I edited the colors to make them stand out and changed the colors around. I really like this photo because I had a really fun time editing the photo and also taking the photo. I could bring out my creativity and do whatever I desired with the photo and I really loved that. I’ve learned so many tools in taking pictures and which angles are the best. I would like to learn a little bit more about portraits and the settings you would use in different situations. My picture is a photograph of a sunset. I titled it “Tomorrow” because there is a sunset everyday and every tomorrow is another opportunity to be better. I took this photograph on my IPhone 8. 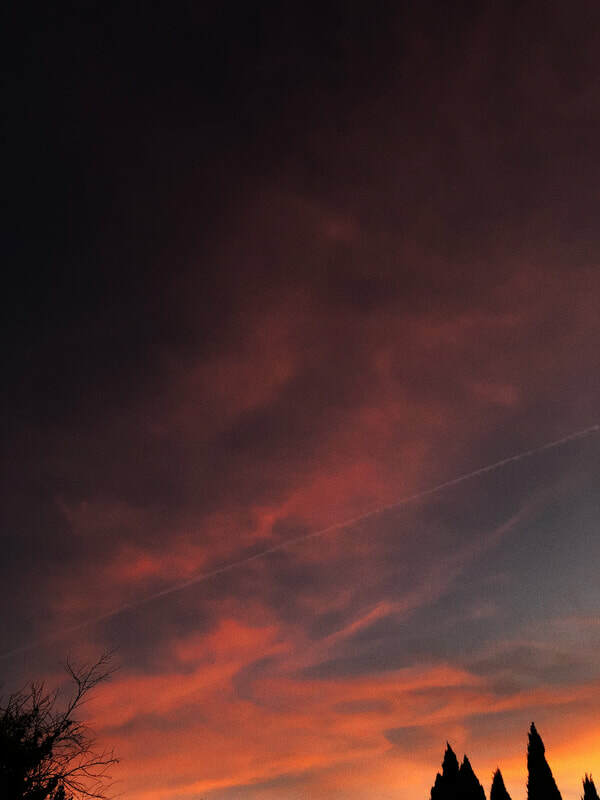 I used the cellphone app called VSCO to make the colors in the sky a little more vibrant by adding the filter called Vibrant Accents. I added 4.9 Grain to the photo as well. I like this picture because the sunset is giving mysterious vibes and it creates a sense of calmness. I think my photograph is successful because it is very well edited and there are no random objects that distract from the sunset. This year I have learned how to take clearer and more interesting photos by using different angles and lighting. 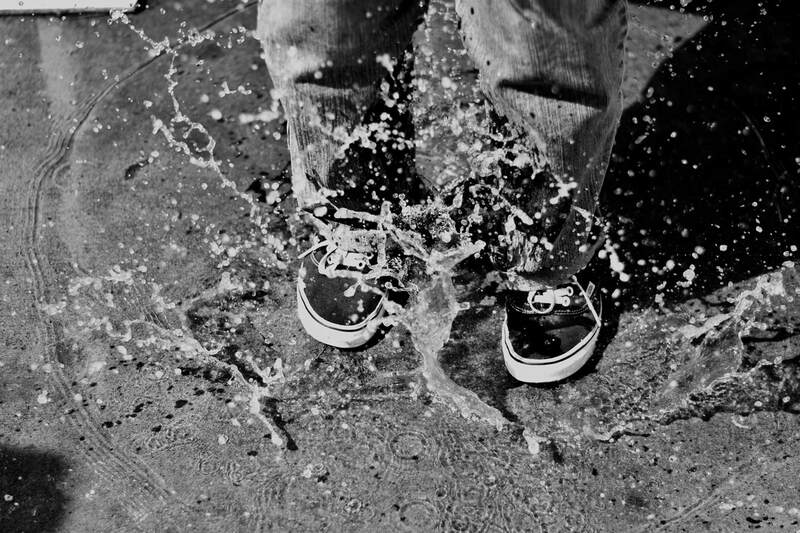 My picture was taken with a Nikon camera at school I titled it “Rainy Days” because it was raining and there was a lot of puddles around school.So I thought it would look awesome if I captured someone jumping on the puddle and then the water would splash.To make this picture I tried to edit the picture using different exposures or by changing the contrast of the picture.But what I ended up doing was making the picture black and white because It would pop out and would look interesting to see.My artistry has been better compared to the beginning I didn't know much and I am really enjoying photography am learning new things I didn't know about. My picture is a photograph of a football goal post. I titled this picture “ Kick to the Gloomy Sky” because as I was taking this photograph I imagined the kicker getting all that pressure on them to score and make the victory win and as you see from the background the sky is lighting up for the kicker to concentrate on just the goal post. I never thought about taking a picture of a football goal post but the thing that made me take this photograph as that the sky was perfect it was and how everything in the background was clear and the only thing that was getting focused was the goal post. What I thought of this photograph was how the only thing I did was get the image focused and get everything in on how I wanted it to look like. And what I’m looking forward to this year is how I’m trying my best to get the photographs that I like. And what I learned this far is take your time while doing your photographs and try your best to make them stand out as possible. And what I’m looking forward to this year is how I can develop new strategies in order to use them in my photographs. I chose to name it “The Mysterious Flower” because there are many things going on in this photograph. 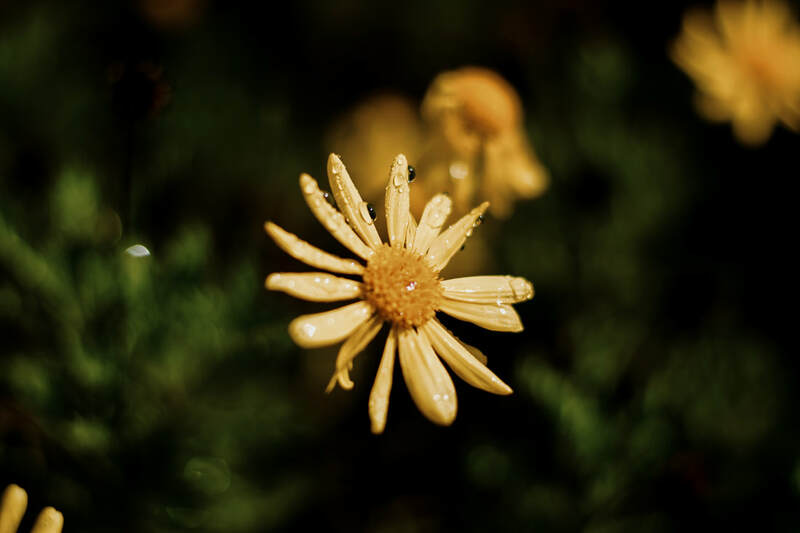 You can see the rain drops on the yellow flower with a cricket on top. 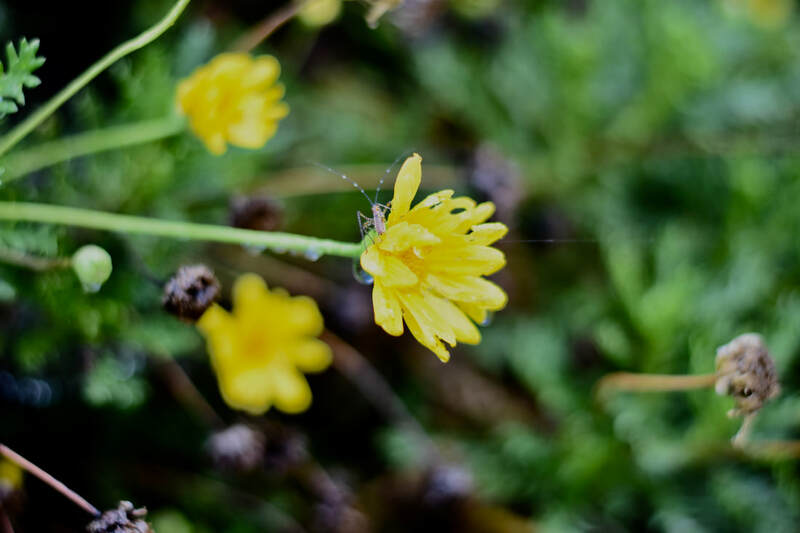 This is a photograph of a flower on a rainy day and I caught the cricket on the flower and decided to focus on that flower in particular. I used Lightroom to edit this, I decided to add a little exposure to make the photograph brighter, so the flower could stand out. I really like this because I feel like it captures the moment after a rainy day. I’ve learned so much this year, My artistry has got better throughout the year. My photographs have got way better as the year progressed. I titled this photograph Life because it shows everyday life enjoying the beautiful sunset at the beach. 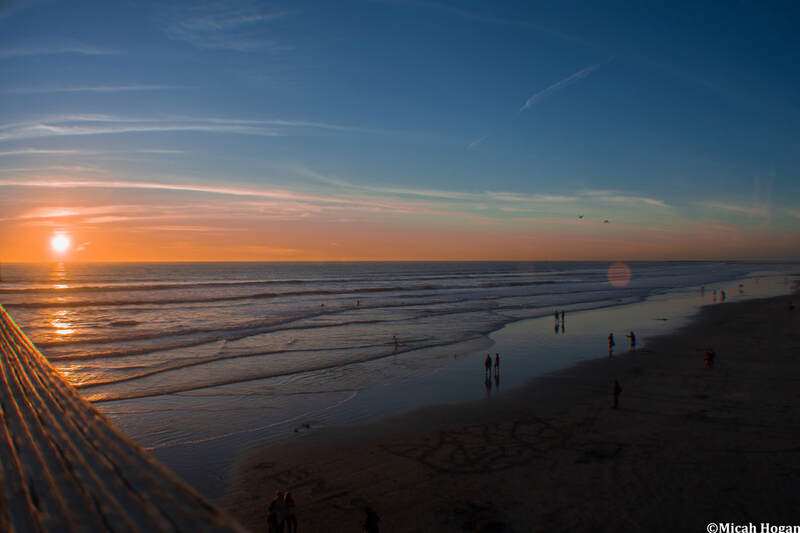 This picture is an wide angle shot of the beach on the Oceanside pier on a nice sunny day. I used Adobe Lightroom cc to change the light levels, shadows and I changed the brightness of the sun to be way less bright. I like this photograph because I love the texture of the wood, how the sun is shining on the wood and how the sun even shines down the waves, everything else looks beautiful as well. 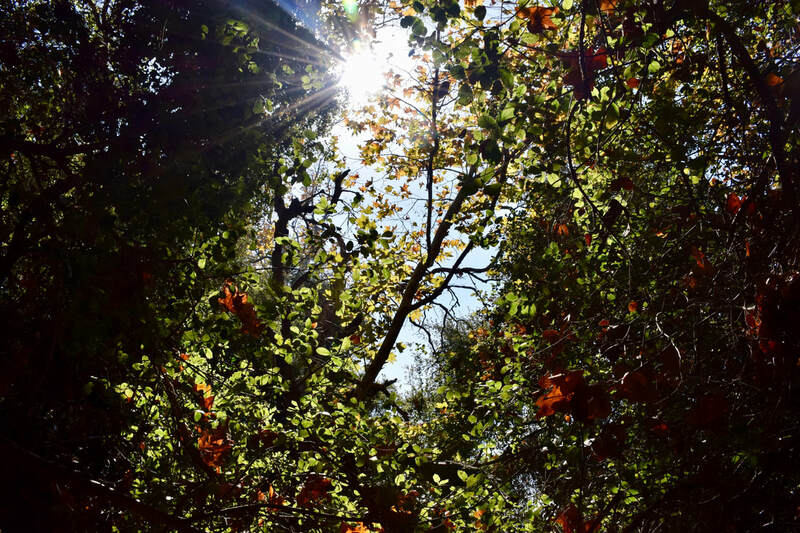 I think It’s a successful photograph because It shows Line, color and texture, The photograph is in focus for the most part and it has lens flare which makes the photograph look nice. How I would describe myself as an artist is that I’m a proficient photography that’s still learning to be more professional. What I’ve learned this year so far is how to do studio portraits and I learned how to do the Golden Ratio style photographs, I’ve been getting way better at photography because of this amazing class and I’m going to miss it when I leave high school. This picture was taken in Hawaii in front of falls. I titled this artwork “Million Dollar View” because of how beautiful the scenery is. I took this picture on accident trying to catch up with my friend that was on the trail. He was stopped in the middle of the trail looking at the view and I saw so my first reaction was to pull out my camera. I came to realize that this picture was one of my favorite out of the group after it was all said and done. The only thing I did to this picture was make the color more vibrant in Lightroom. 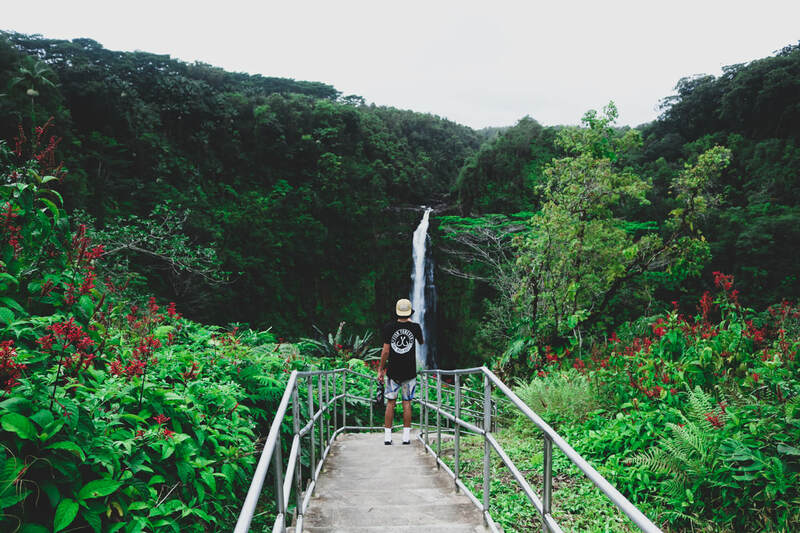 I feel like this could be a successful photograph because you don’t just go see tropical waterfalls every day, you have to hike to them and most waterfalls are in parts of the world you have to travel to. The words I would use to describe myself as an artist is simple, creative, and fun. I don’t like making things to complicated like changing a lot of camera settings or moving spots or positions so that's where I get my simple side. Everything I do that has to deal with art or something I know someone is going to look at, I have to do it creatively. Doing something with creativeness makes whatever your doing much more fun and it will be better to look at then something boring. I’ve learned a lot this year with photo editing. We have used lightroom and photoshop to edit all our pictures with and it has been very helpful for me inside and outside the classroom. I'm excited for the rest of the year and whatever else is coming my way. I have titled my photo Mini Sunflower Close Up because it is such a clear and close shot of the flowers. 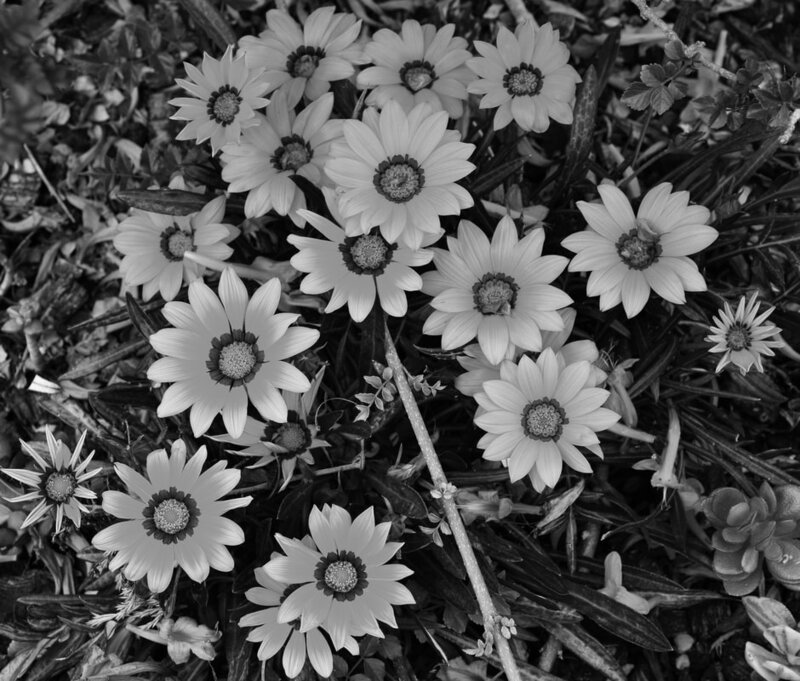 This photo is of a small patch of flowers. For this photo I took it with a Nikon camera and to edit, I used Adobe Lightroom on a iMac and simply added a black and white filter to desaturate the photo. I like this photo because you can really see the patterns in the flowers and the details. This photo in my opinion is successful because it's very clear and portrays a somewhat mysterious vibe due the the addition of the black and white filter. Myself, as an artist, I would say I’ve come a long way by learning the use of technology to capture a moment and create a memory rather than just looking at it for the meanwhile. I really look forward to learning more about the art of photography and what use it can come to. I’d also like to learn how to use the camera and how the different tools within it can become useful. 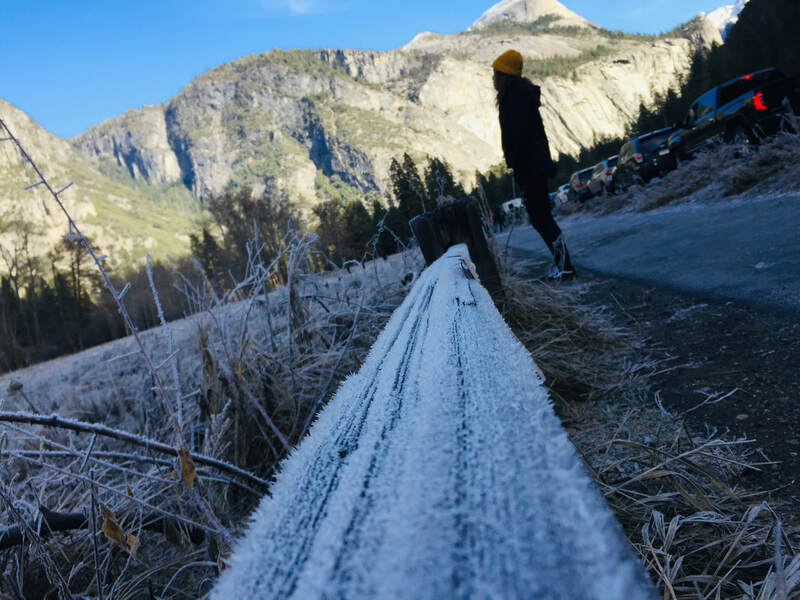 Daphne Limon, class of 2020, yosemite National Park. I titled this by the name of the park because i liked the name of the park and i didn’t think i would like another name for it. This picture is a picture of my sister looking off at the view, i thought it was a really nice photo to capture at the right moment. I took this photo on my Iphone regular camera and used a filter called vivid cool. I liked this photo because i liked how the ice/snow pops out on the wood and it's the first thing that brings your eye to attention. I would describe myself as a artist that still needs a long way to go but, i’m learning little by little and my photos might still not be that great at the moment but hopefully i will get there. What i have learned so far this year is the parts of the camera and what to use to take a photo with and what not to do when taking a photo. What i’m looking forward to doing is taking better photos and capturing more moments and seeing what other exciting assignments are coming up. My picture is of a puddle outside of the locker rooms. I titled it “Rainy Day” because I took this picture the day after it was raining all day. I used Lightroom to darken the background of the photo so the colors in the water would show more. 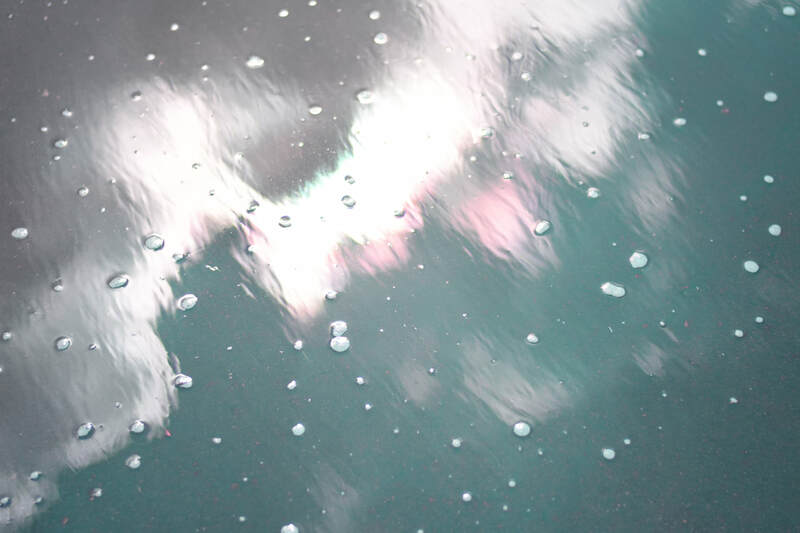 I did brighten the colors in the water a little bit in the reflection. I really like this photo because I like the idea that the photo is basically of a puddle and I guess I was just at the right place at the right time because the angle I was in really captured the beautiful colors in the sky. I think throughout the year I have grown as a photographer and have found what I personally like to photograph which is nature or just taking pictures of the outside I think it’s really beautiful and there is more perspectives to look at nature. I have learned so much this year although there is a lot I still have to learn I think I can now capture things more clearly and try to manipulate a photo the way I want. 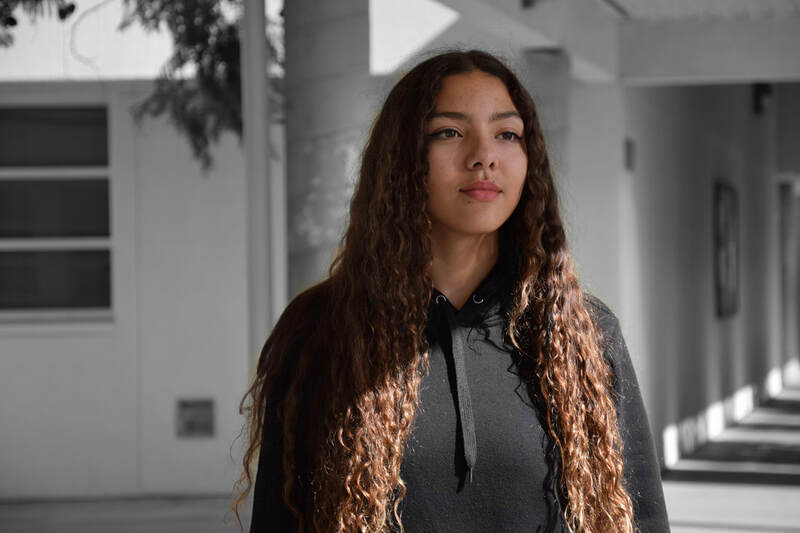 ​My name is Sabine Manachi and I’m a part of the class of 2019 at RBV. This is my photo titled “Camila.” I took it of my friend Camila in front of these extremely tall trees in a field at a random winery in Julian, California one day in November as part of my Artist as Mentor project. I took the photo on my friend Amanda’s Canon T5i and edited it on VSCOcam. 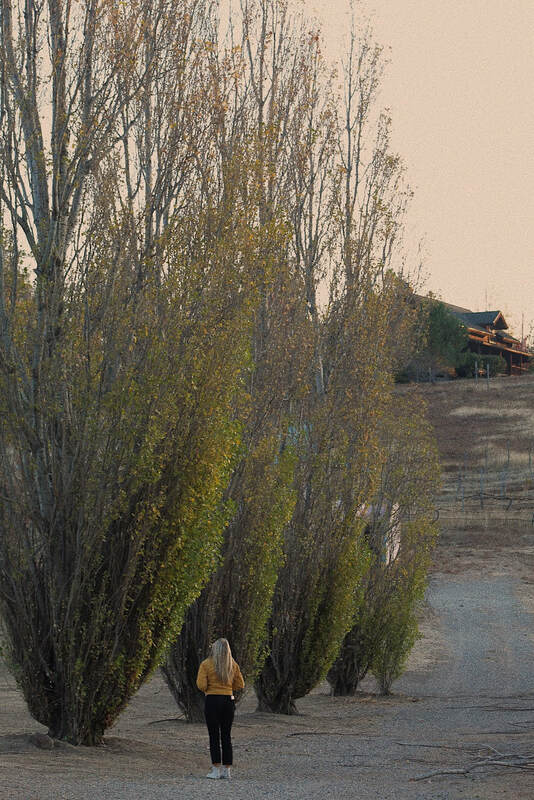 I love this photo because it portrays a random teenage girl wandering around, which really embodied Olivia Bee’s style. I also love the vintage vibe with the grain and the warm tones. As an artist I’d say I really like photographing nature or aspects of the sort because it’s beautiful and something I feel enriches myself as a person along with my work. I have learned a lot about composition, angles, color schemes, etc. and am excited to learn more about photography. 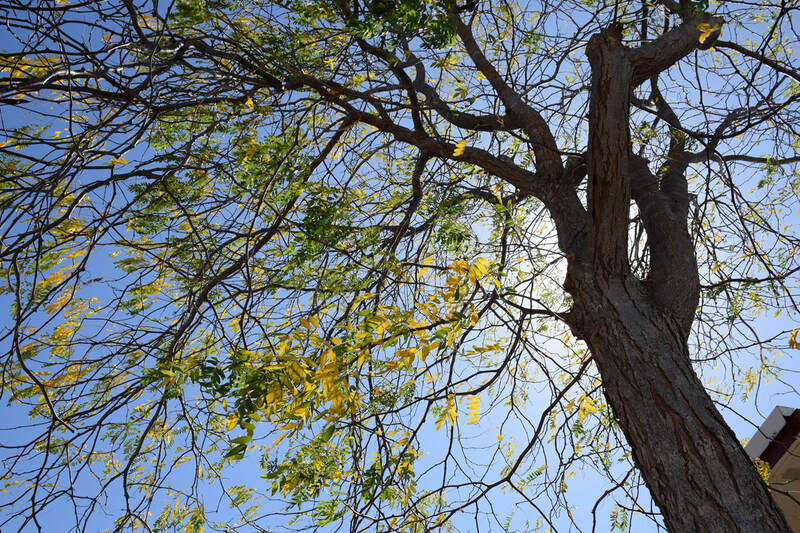 My picture is a photograph of a tree here at school. I titled it “nature” because this tree is a little bit of the beautiful nature that we have here at school. Which is something that since I am a senior I will miss about RBV. I had four different pictures of this tree but the other pictures were too exposed and I didn’t really like the angles I had taken them in. When uploading the picture I liked how it turned out so I decided not to do any editing or photoshop to it. My pictures over the course of the year have slowly gotten better and I hope by the end of the year that I will become very comfortable using photoshop. My picture is of a spider on a yellow fire hydrant. I titled it “spiderman” because its a picture of a spider, and that’s what came to my mind. I took this photo on a rainy day, i edited this on Iphoto, I lowered the brightness. I like this photo because of how it looks where the raindrop is at, it looks as if the spider stopped the water. I think its a successful photograph because I captured the picture at the right time where the raindrop looks like that. 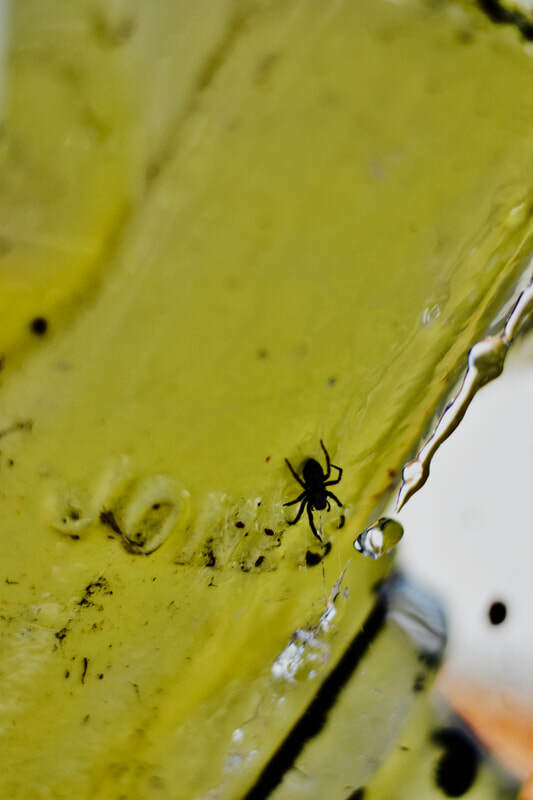 Also on how the background is blurry and very clear on the spider and the water drop. This year I have learned to take clear photos. I look forward to becoming a better photographer. I named this picture A New Path because the stream of water is leading you to a different place. The picture is of a stream at the duck pond. The stream is leading the viewer to another place where you can go to. 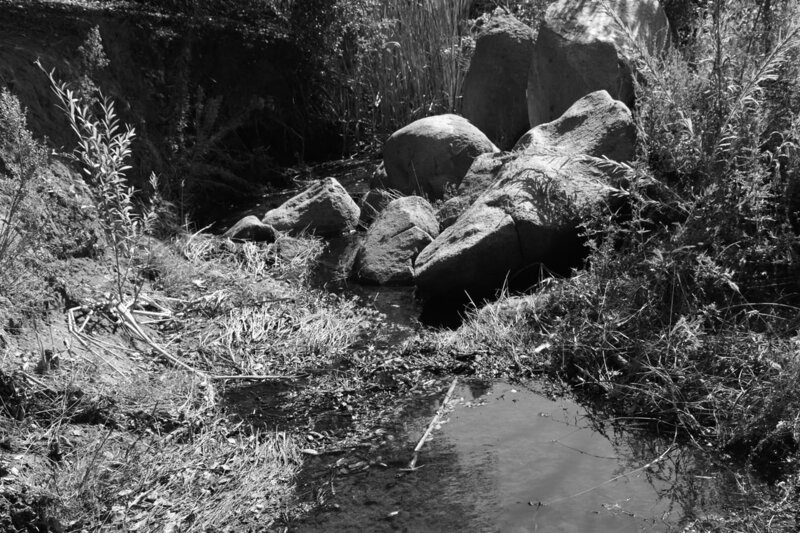 To make this picture I used a camera then I turned the picture into black and white and went to the duckpond. I like this picture because there is a lot of nature and I like nature. This picture can be successful because it is unique and not a lot of people do it. I think that I am an okay photographer but I need to improve a lot. My picture is of a bench with water dripping on it after a rainy day. 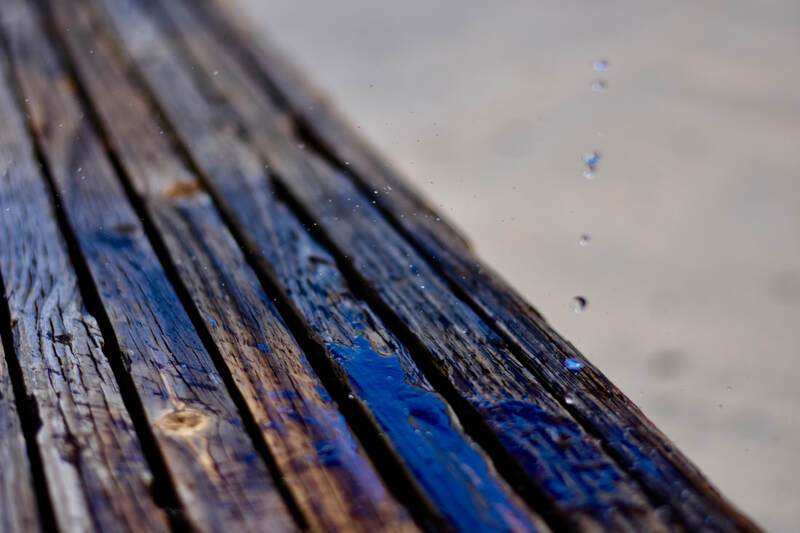 I titled it “Simplicity” because people don't appreciate the beauty of the simple things like water dripping on a bench.To edit this picture I adjusted the exposure and the contrast, to darken the colors of the bench and the water. My ability to to edit and create pictures has surely improved through this year. 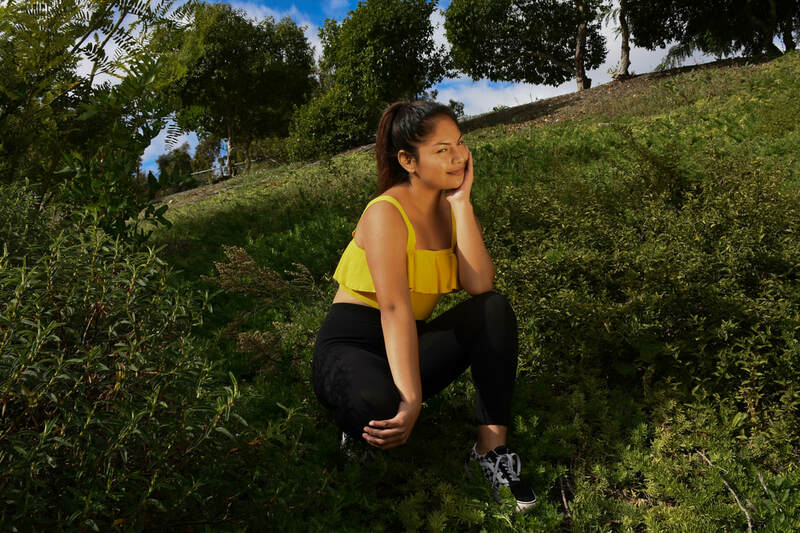 I titled this picture Into Nature because she is surrounded by all green and plants and makes the clothes that she is wearing stand out with the yellow. This is a portrait of my friend during school in a field of green plants. To make this picture i used a light reflector to fill in the shadows caused by the sun. I like this picture because of the contrast in colors with her clothes and the plants. I would describe myself as someone who likes to keep things simples in photo and not do much editing to them. This year i have learned photoshop and the settings on the camera and the difference they can make. My picture is in HDR photograph of a path at the duck pond. I titled it “Coneflower” because that's is what the name of the flower is called. I took this when we had a rainy day in the morning but by the time I went into photography it wasn't as much so our teacher gave us squirt bottles to make it seems like the rain is coming down. I chose this picture because I like the way that I captured the drop of water or rain just in the pedals. This photo was actually taken last minute when our time to shoot pictures was over, so it was right nice that I just thought that I should just take one more photo of it. The way i took this picture was using portrait mode to make sure that the background is blurry and just make it focus on one specific thing which was the flower in this case. During the couple months that I have been in this class has taught me a lot about capturing the perfect moments and how you can turn any object or item into something outstanding. 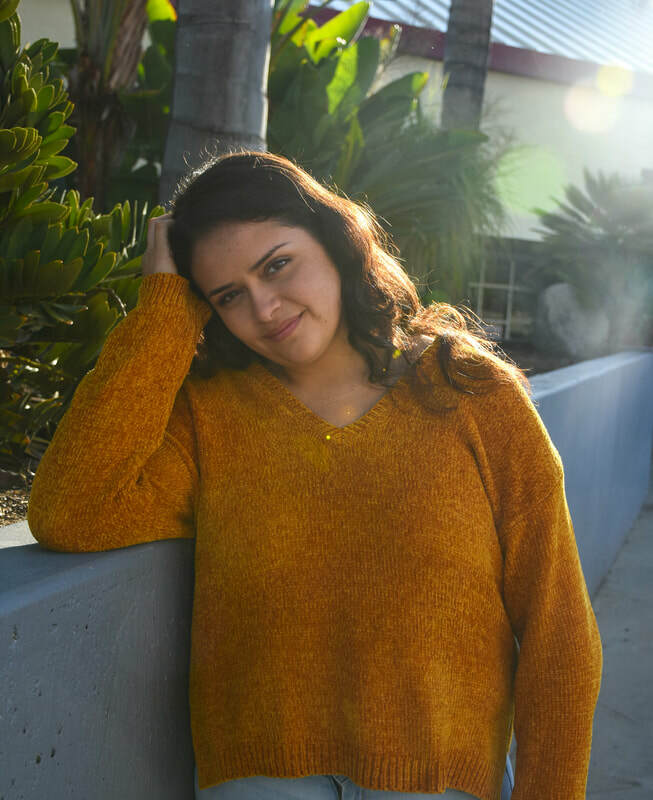 ​Bianca Perez, Class of 2019, Balance of Colours. I titled the photograph this name because there is so many colors that stand out and they blend very well together, I decided to add the balance because there is leading line in the photograph and it just made me think of someone balancing on the line. 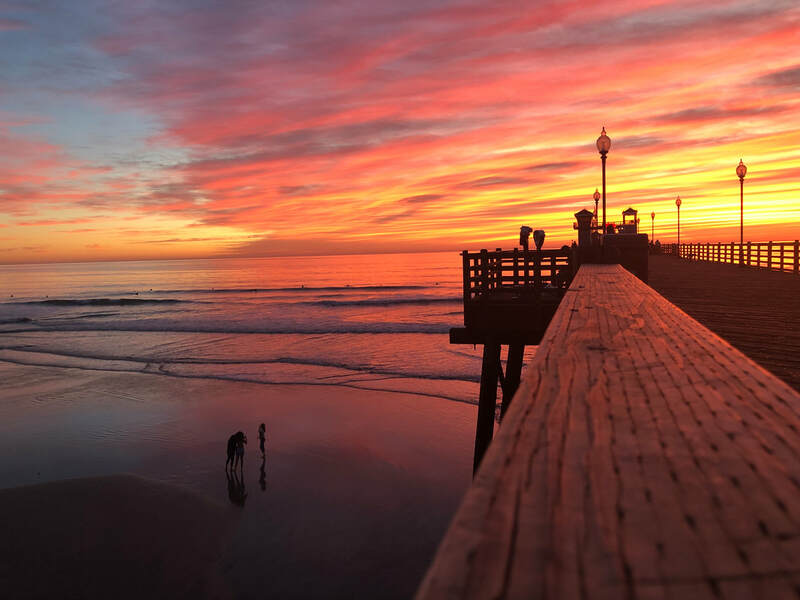 This picture is of a sunset and it was taking at the oceanside beach. I actually did not edit this photo at all, all I did was lower the brightness on my phone before the photograph was taking to make the colors stand out more. What I like the most about this photograph is the sunset and the beautiful colors. Pictures like these are the reason a spark of interest in photography began in me. My artistry has improved drastically this year and I think my photograph portrays exactly what I wanted to capture. 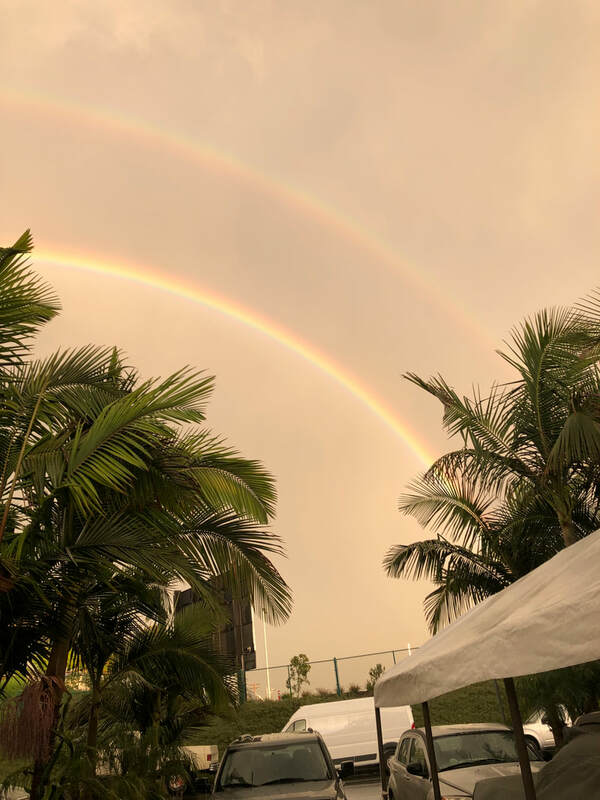 I named it double rainbow because it is a picture that I took in my backyard about a week ago of a double rainbow that appeared after it was raining all day. It is a photo that I took with my Iphone XR and used the portrait setting. I like it because I think that people in southern california dont get to see a lot of rainbows because it rarely rains in southern california, I think it is a successful photograph because it is a clear picture of a rainbow. I would describe myself as a artist that likes to take photos of things outside out in nature.this year I would say that I have learned how to better handle a camera and it has also gotten me more interested in photography. I am looking forward to learning more about cameras and photographs as the school year continues. I titled this photograph The Cracks Beneath because at first glance you notice the person’s reflection in the puddle but then you notice all the cracks and scratches of the ground beneath the puddle. It was raining earlier that day so there were lots of big puddles around. I told them to stand at a certain spot so I can take this photo. To edit it I used Lightroom. In Lightroom I adjusted the colors so they were a bit more vibrant. I like this photograph because I like how you can’t really make out anything about the person. You can just see their body and underneath all that, you see the cracks and scratches. I think this is a successful photograph because of the texture. 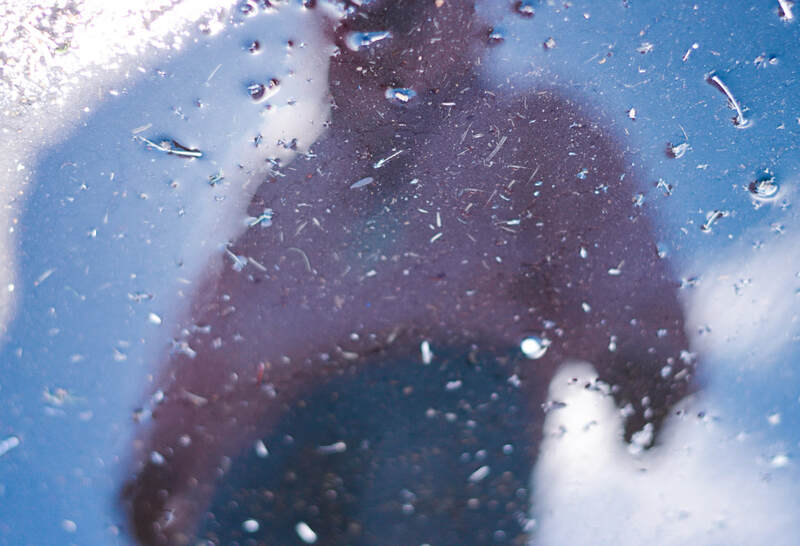 You can see the texture of the ground and the drops of water throughout while also seeing the person’s reflection. As an artist, I think I’m creative. I’m involved with music and also like to draw. In photography, I love playing around with the colors and different perspectives and ways you can tell a story. I’ve learned so much this year; how people use different techniques and how to manipulate photographs to tell a story. I’m looking forward to learning more about Photoshop and how to use it. 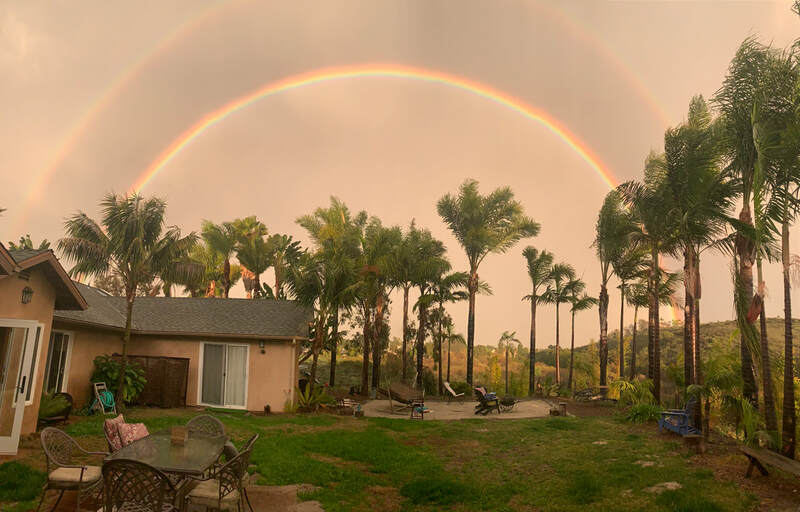 ​Seth Ramirez,class of 2021,Rainy Day Double Rainbow. 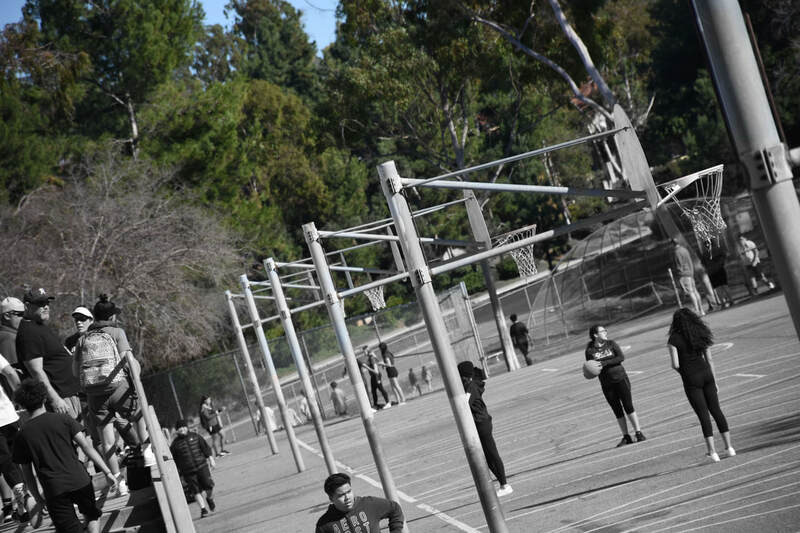 ​Jonah Rivas, class of 2020.I took a picture of the courts with my camera that Ms. moncure gave me. I slouched over the railing so I can get the basketball poles kinda lined up. Then I saw there was a real cool green in the background because the trees. The trees had so much color compared to the basketball courts. Then I made two copies of it on photoshop. Then I made it black and white then I made the layer mask so that i could bring the color. For my other photos I was also on the courts I saw that there was a bunch of colorful backpacks. I thought that, that was super cool. Then I also made two copies of those. I made it black and white. I aslo put the layer mask on it. 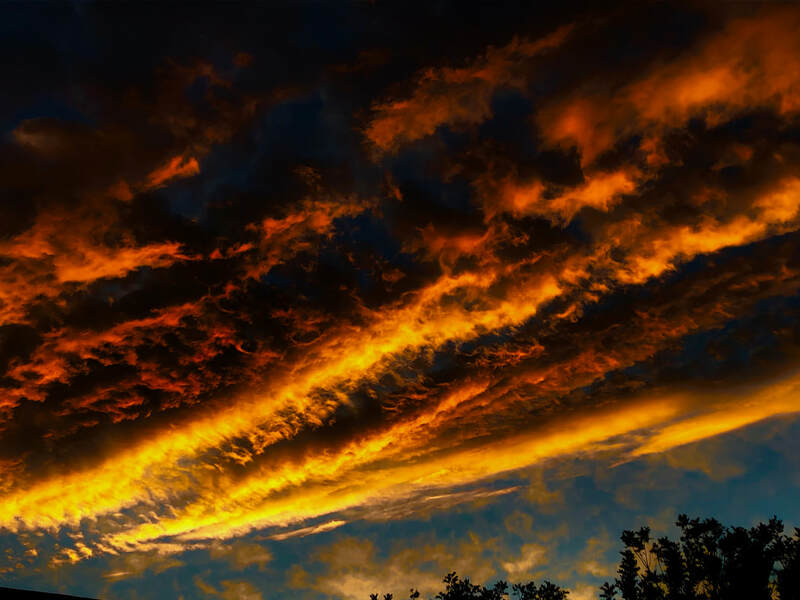 I took this early morning photo of our sky here in Vista from my apartment balcony, with my I phone 8. I feel that it looks like the shy is on fire. The reason I named this “beauty has no label” is because well like how it is said beauty doesn’t have a label is because short,tall,black,white ,chubby,skinny, in my opinion i think everyone is beautiful and myself from experience i know how it felt to not feel confident in my own type of body.That’s why i chose to pick out a picture of myself.Though have been teased for being bigger than others i like to show that i am who i am and if that not what others want then that’s on them. I created this image in photoshop and this image was taken here at school. The reason i like this image is because of the statement i added and how i’d hope this can make an impact on others and to reach the form of self love. I personally don’t think this isn’t a very successful photograph because of how the photoshop came out. As an artist i would claim that i’d like to create an image that can influence people in the best ways. This year i have developed so much and i gained a lot of knowledge, for example i learned how to photoshop my face on other peoples faces i thought that was interesting. Later in the year i’d like to learn more exciting things to create in photoshop. 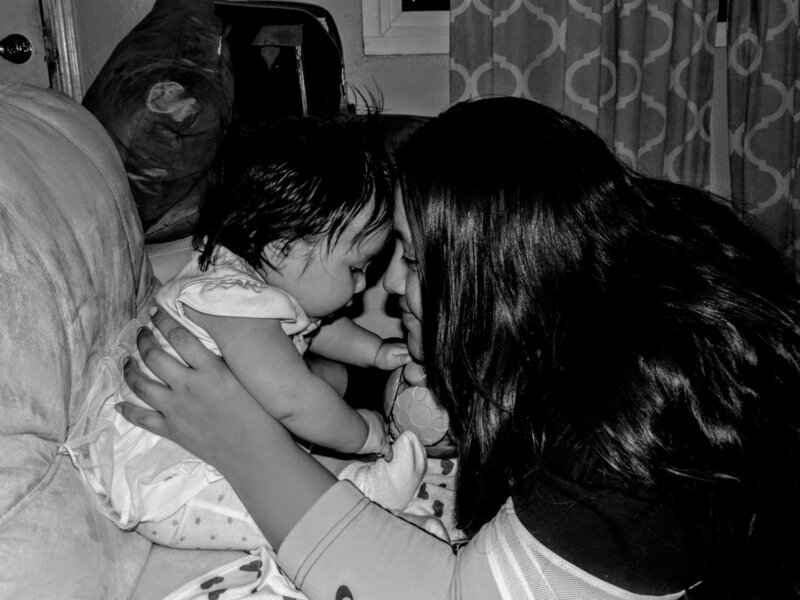 I titled this picture “Jacky” because thats my baby sisters name (Jacqueline) and the picture is revolved around the idea of how much love my stepmother shows her. The picture is of my baby sister Jacky and my stepmom Alex. In the picture Alex is holding the baby very closely and trying to kiss her. But she was so concerned with the ball that she didn’t even notice. I took me around ten tries to get the perfect picture of both of them looking at each other, but in the end i decided to choose something that was very sentimental yet kind of funny.I had taken the photograph using a Samsung Camera with the exposure somewhere between 3- .5. In order to edit the photo, I used adobe lightroom to change the color from something that was very vibrant to something as simple as black and white. I had taken the picture as an example for my “artist as a mentor” project and ended up taking on of my favorite pictures from this year. The photo was taken on the living room couch in my house. I like the picture because it’s of my baby sister. At the time she was around 3-5 months. I never really had any pictures of my other little sisters so I wanted to make sure that I had hers from when she was little. I think this photo was successful in it’s own way. Although I had intended to get a more sentimental picture I ended up with something like this. I feel as if anyone could get a picture with a baby looking at it’s mother. But I don’t think that anyone could get a picture of the baby completely ignoring their mother. I would describe myself as a portrait person more than anything. I have learned a lot this year. I used to think that filters could fix everything, but now I know that it takes more than that. If you want to take a good picture you need to seize your opportunity, make sure the exposure is good, and do whatever you want in order to make the picture perfect. 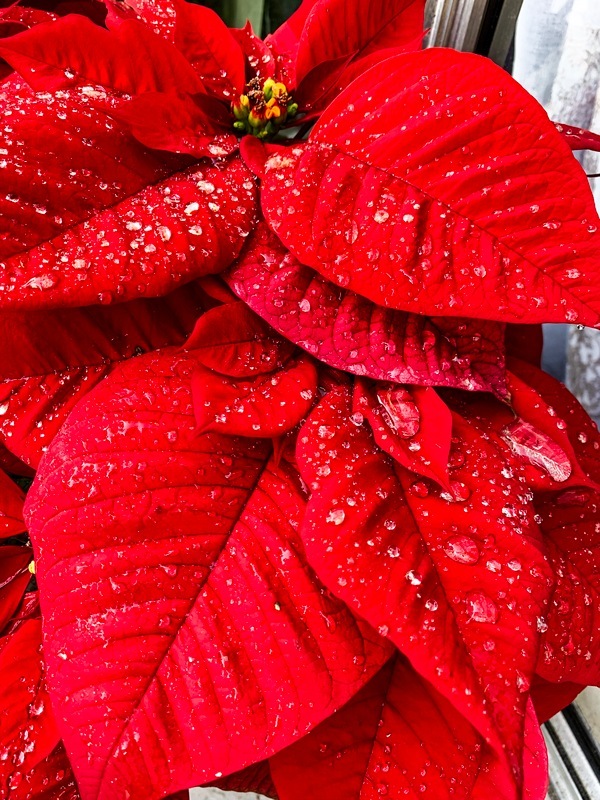 I chose the name “Scarlet Poinsettia” because the poinsettia appears scarlet and scarlet has a sense of beauty and mystery which is everything the picture showcases. The picture is of a Poinsettia plant my dad gave my mom around the christmas time. I used Lightroom CC to add a depth to the raindrops and to brighten up the red of the leaves. 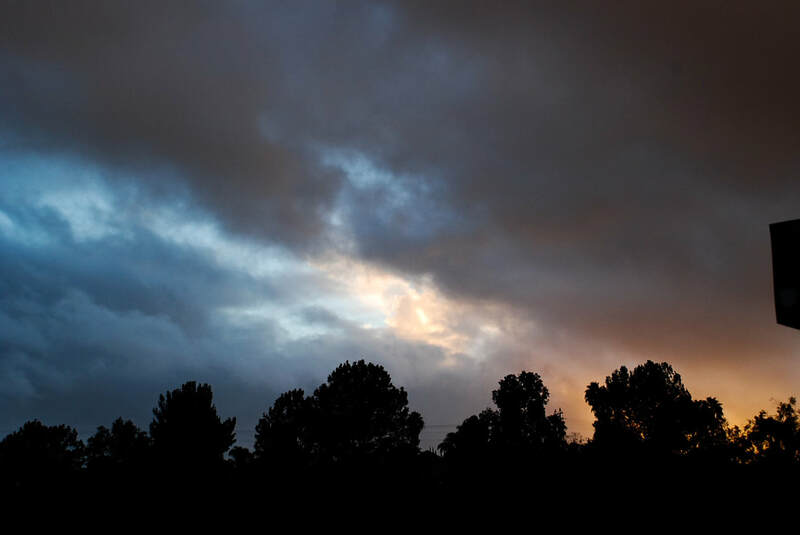 I like the photograph because it presents the beauty after the rain, the calm after the storm. I believe the photograph is successful because a story is told through the rain, leaves, and color. The picture allows imagination to flow through one’s mind as you look at the picture. I would describe myself as an intimate photographer because each picture I capture I pull out a certain depth in order to provide a sense of gentle beauty. This year I have learned most of my own style as a photographer while studying other photographers. I’m excited for learning new ways to use photoshop and add magical elements to my photographs. I called this photograph I took “Calmness of The Jetty” because the water just looked so smooth and calm, with no heavy current. 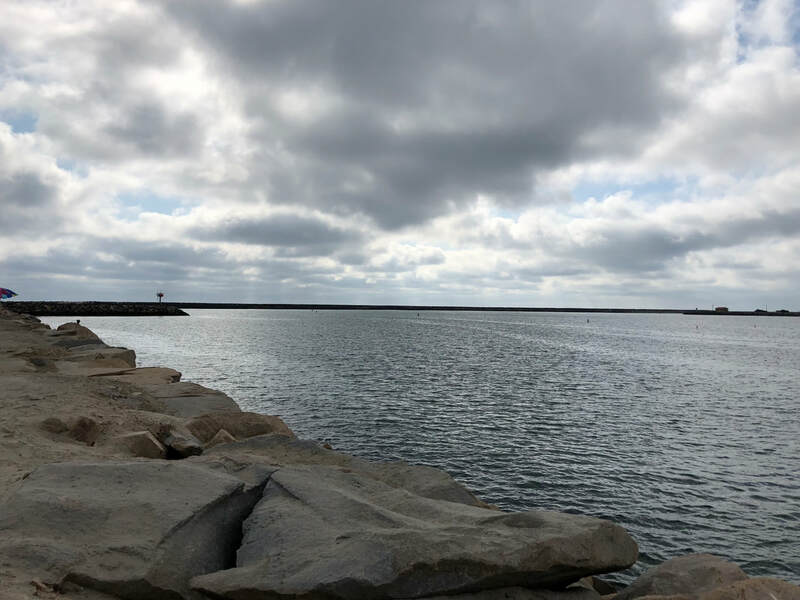 This picture is taken North West of the Oceanside Harbor and I took the photo with my IPhone 8. I like it because since I was about five years old, me and my dad would go here and go fishing every weekend. The scene of the day just felt really nostalgic and took me back to when I was a kid, so I thought it would be a successful photo because every time I look at it, it’s really memorable. I’m not the greatest artist in the world, but I do know when the setting is perfect to take a solid picture. Though I wasn’t in the class during first semester, I learned how to use the camera a lot better and make clipping masks easier. ​My name is Austin Toland, Class of 2019 and I named this piece Hero. I decided to name this piece Hero because it was used for a project in my photography class, called “Heroes Around Me”. The photo is of my uncle who is a captain in the Navy. 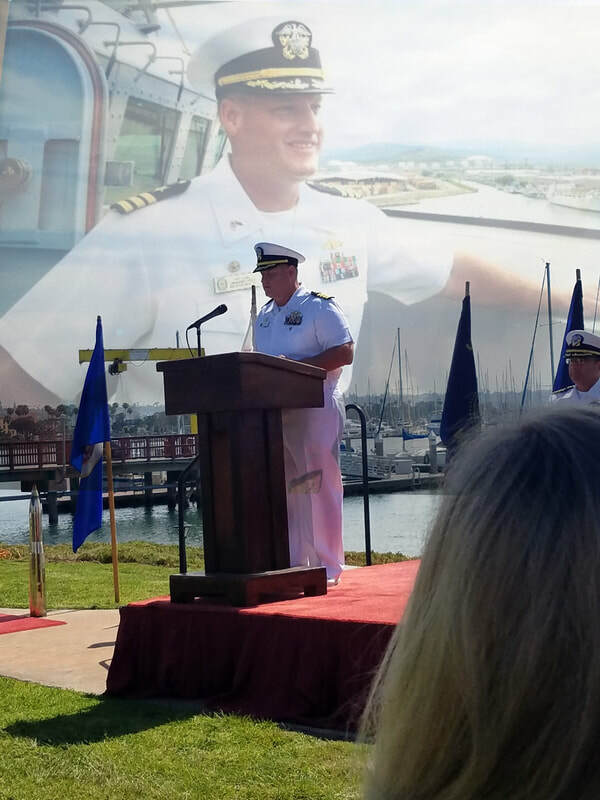 It was taken at his change of command last year and the kind of faded one was taken when he was on his first destroyer that he was captain of. 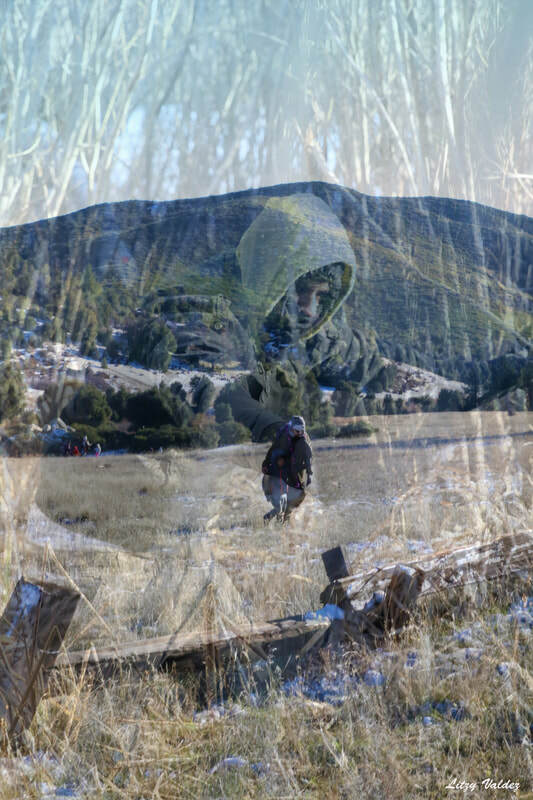 I put this image together using Pixlr, an app on my phone that allows me to overlay one photo onto another. I like this photo because I think that it came out really nicely and I feel that it really connects with how proud I am of my uncle. I think that it is a successful photograph because the faded one fits nicely where the sky is and the original photo at the change of command is solid and still very visible. I would describe myself as a decent artist. I think that I am a good photographer when it comes to nature and wildlife, and I think that I am a pretty good editor when it comes to imaging my photographs. This year I have learned how to use digital editing and imaging programs as well as what to look for when taking a photo. I have also learned how to use all parts of the camera and I have learned what to use for certain photos. This year I am looking forward to taking my own photos when I am fishing and out in nature. 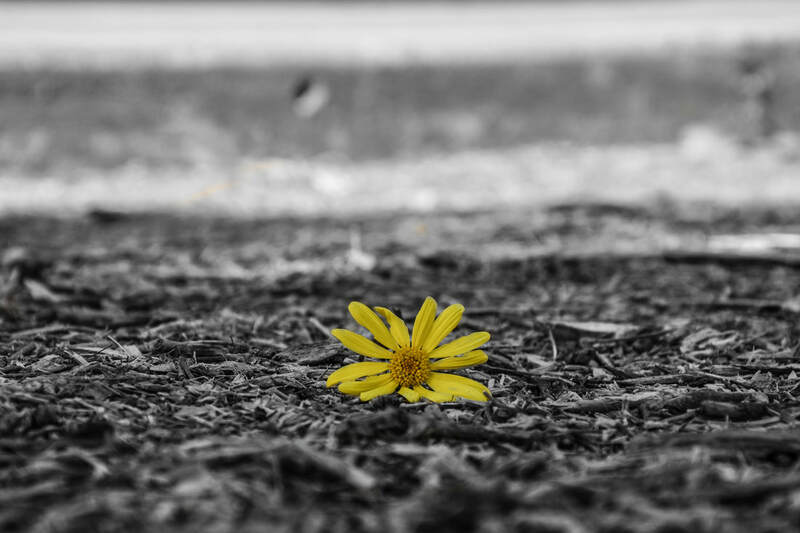 Mateo 2019 and the piece is called lonely days,I titled that name because the flower looks lonely.This a picture of the flower on the ground i changed the photo in photoshop.I like this photo because i took it randomly and the people will never think to take that.I describe myself as a mellow artist I have learned that you can never stop taking photos if your a photographer you just gotta keep taking pictures. My photograph shows a water balloon approaching my classmates face. I title it “ Bulls Eye” because the rate at which th balloon was flying it was going to hit him dead center in the face. The photograph is unedited. 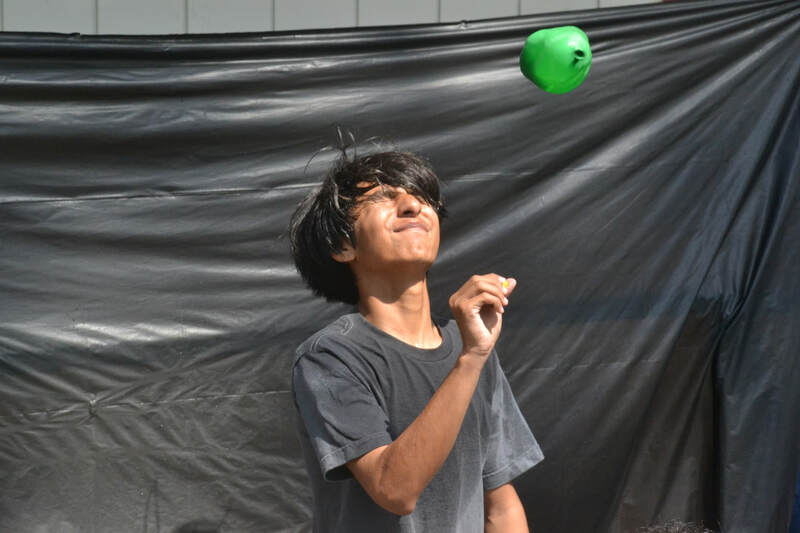 To make this picture I had to time it perfectly of when the water balloon touches his face, I had to take t about 4 or 5 times. My photo is of a close up on the fence with a side view of the track, but it is blurred out. I titled it “Where It’s Dark There’s Always light” because the photo is black and white, also it gives a sad vide but then you look one the opposite side and there is a pathway. It gives people different vibes, but my main description for the meaning is that no matter what there is always a path, clear the path and choose a different direction to go. As I said, this photo is of a close up to the fence and the bleachers and the track blurred out. During this time we were using Lightroom and so what I did to create this photo was just use different black and white filters and slide the exposure to where is not too much of one color. 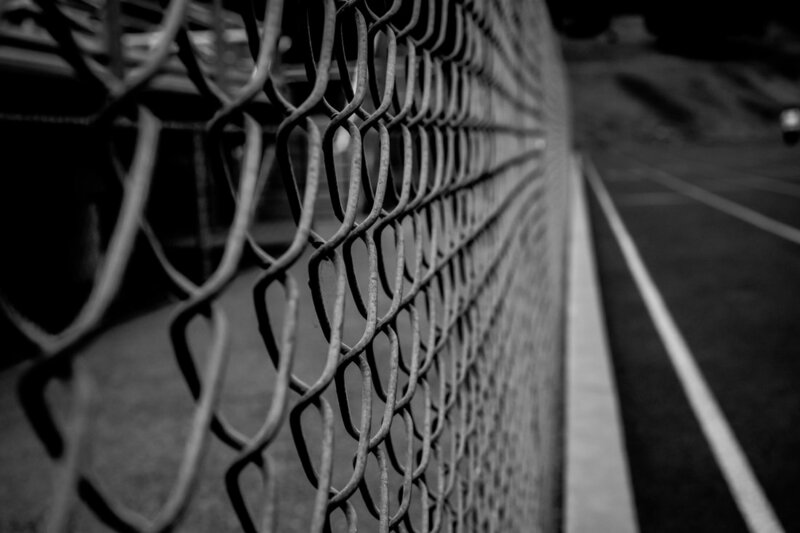 I really like this photograph because it is the first one that I took and turned out to be really great and the fact that the main focus is the fence is awesome for me. Not only the look of the picture, but the emotion you get from the photo could be different for everyone else. I would say I am a landscape artist because I enjoy taking pictures of nature and plants. I’ve learned the different setting for the camera in different settings. I just look forward to learning more interesting ways to deal with photos making them more outstanding. I titled the photograph “A life of a bee”because that is what a bee does every day a bee just collect pollen.This photograph is a close of a bee in a yellow flower,I used adobe lightroom classic to fix the photo but besides that I didn’t really edit much I just came out like that there was nothing special I did.I like this photo because first I tried to capture the flower but the bee flew in the shot and I took the picture in the right moment when it landed.Also it’s a successful photo because you can see the texture of the flower and the bee,I think that what makes it a good picture.I learned a lot during this year,because when I started I didn’t know how to work a camera but I think you could see progress in my work.I’m looking forward to learn anything new and useful ,I’m opened to learn different things everyday. I named this spice perSPECTive because the definition of “spect” is nonstandard form of expect. 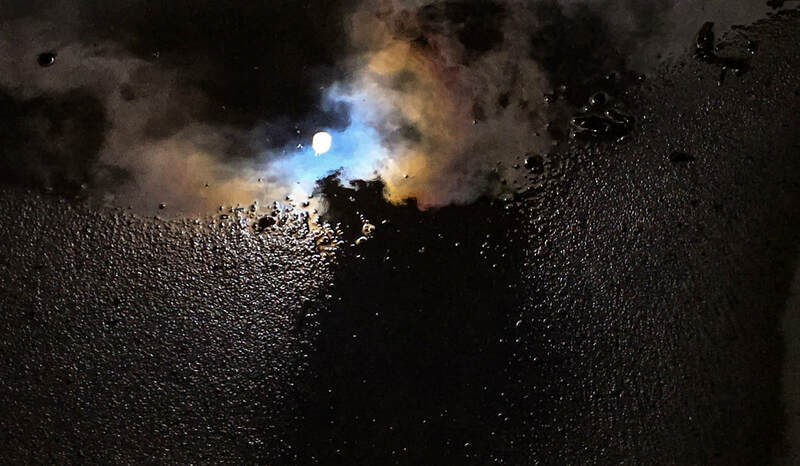 This piece had two different perspectives so it’s up to the viewer’s eyes to see them. The picture is of spontaneous family trip to Alpine during the winter break. I randomly shot pictures of the scenery. What I did on photoshop is layer masked an image on top of the other and then I lowered the opacity of on to create a dramatic image. What I liked about this image is how it wasn’t a planned shot and it came out decent. As a photographer I would describe my work as “spontaneous”, because the majority of my photographs aren’t planned or staged. I’m looking forward to knowing all the setting of a camera and how to change the settings depending on the shot I have to take. I still struggle with it today. This is an image of my best friend Kayla Durkes. I titled this photograph “ My Best Friend” because her and i have a very strong bond. We do a lot of things together and have a lot in common. My love for photography started when Kayla, my sister and i would get dressed up to have photoshoots together. We have been through a lot and we have been living our best life during high school. I edited this photo on Adobe Photoshop. I didn’t do a lot of editing because she is naturally beautiful. The photograph was over exposed and i changed that. I like a lot of this about this photograph. I love that Kayla looks very fierce and confident. I love the color combination, and the warm lighting. I love that her uniform brings back blash backs of football season. This photograph also reminds me of how happy i was to see her make the varsity cheer team. I think photography is a beautiful form of art. I think as an artist i am very good at bringing out the beauty of others. I am looking forward to learning and improving my editing skills. I titled this image “Vivid Color” due to the meaning of vivid color being intensely deep or bright. This image is of a beautiful succulent. To make this picture I opened it up in photoshop and duplicate the layer. Then I made the photo black and white my clicking on image then adjustments. 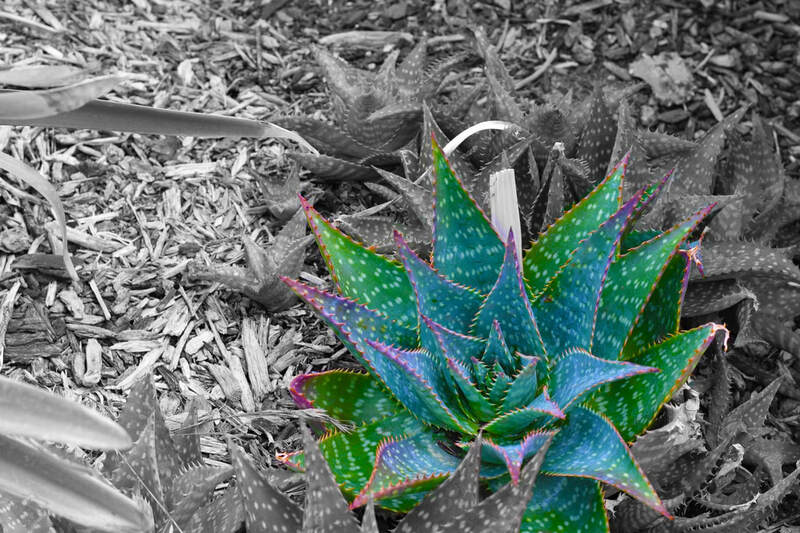 I added a layer mask and using the black paint I brushed it over the succulent to reveal its true colors. To make the colors pop I clicked on color balance and adjusted the color so it looks more vibrant. I like this photo because of the way the colors stand out. They different colors of blues, greens, and purples really catch my eye. As an artist i’ve grown to really capture what I want to show. I learned that you really have to focus to capture the perfect image. 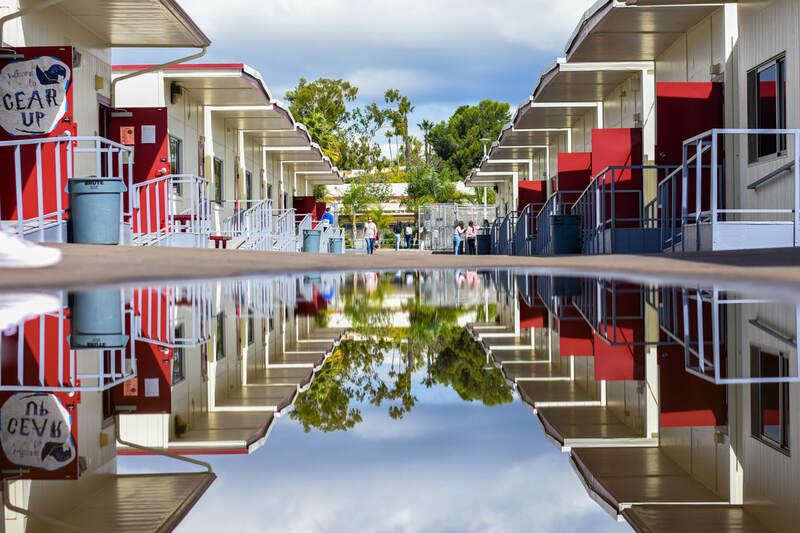 My picture is of the walkway in 800 classrooms after it rained. I titled it “ School Contemplation” because the photo is a reflection. I think this photo has a deeper meaning in reflecting on what this school has done for me. I took this photo using a Nikon D7500 at 400 ISO. I opened the photo in Lightroom and adjusted the exposure, contrast, highlights, etc. I also had to crop the photo because I took it slightly crooked. This photo represents the style of photography that I like. I like strong contrast and landscape photography. My picture Exploring Mexico was titled that because it is of my family trip to mexico and our explorations of the different cities including The Guanajuato city which this photo was taken of. 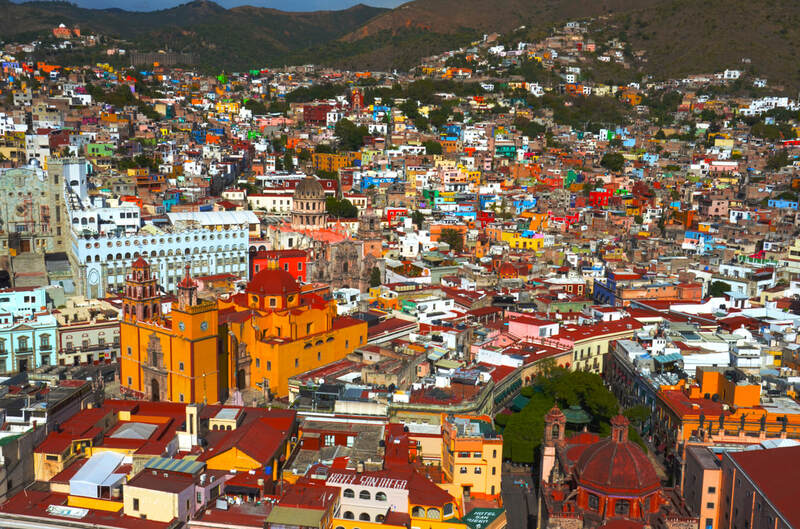 This HDR picture is of the beautiful city of Guanajuato, on a mountain from the side of the road. When making this one photo I had to take five pictures of the view with different exposures. 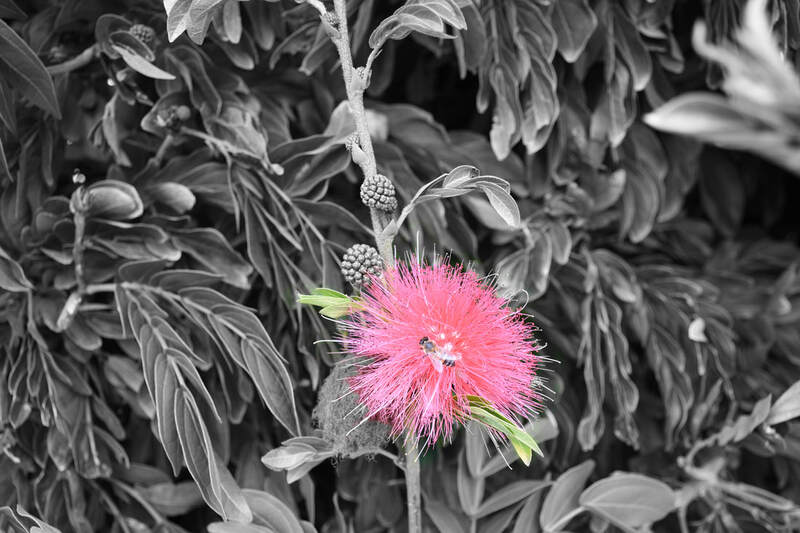 Then I merged them all in photoshop and by doing this you bring out the colors and it makes the photo HDR. I Really like this photo because it's one of my first experiences using HDR and it is in my top ten best photo i’ve taken because of how beautiful it came out in HDR. I think as a Photographer I still need to learn more but I know i’ve improved because of my pictures now and before. I hope to learn more things in photoshop to help improve and learn new styles of photograph. 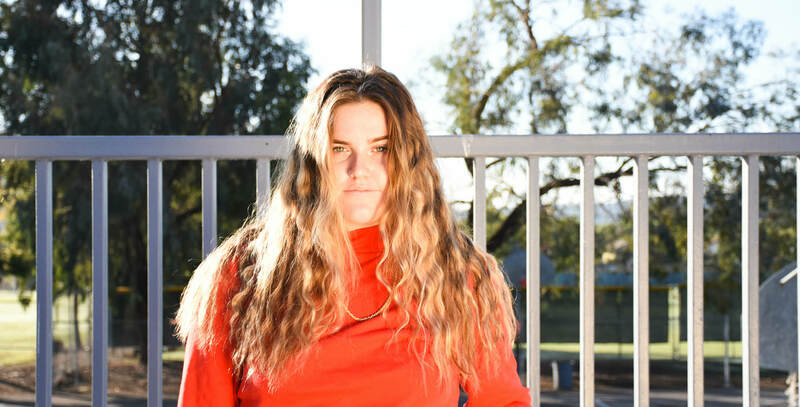 ​Amanda Zachry, class of 2019, “Aliyah”. I titled this photo “Aliyah” because this picture was taken of my friend named Aliyah. I think the picture is a perfect representation of aliyah because of her facial expression and body language. She is a very innocent person yet such a beautiful person who doesn’t know how beautiful she really is. I took the photo on my Canon t5i and used the app vsco to edit it. I used a preset filter but I lowered the intensity of the filter to make it look more natural. I then added vignette to make the picture look more old school. I wanted to make sure the picture looked as natural as possible while still accentuating her features. I like this photo because one of my favorite things to photograph is people and taking headshots of people. I believe this photo is successful because it was unplanned and i feel like people look the best when they aren’t trying. I also love the shadow of her face ad body. As an artist I would describe myself as a very modern clean photographer. I don’t like a lot of background and if there is a lot of background I like a plain foreground. I’ve learned a lot this year about photography especially a lot about the camera. Before I would just take any picture in any setting and now i’m aware of what setting i should take what picture in. Hopefully in the future I will learn more and be more successful in photography. I titled this photograph “Red” because of her shirt and how it stands out. It’s a picture of Harlie that i took at school in the quad. I used lightroom to edit it and make it brighter. I really like this photo because I like how her eyes and shirt stand out a lot. This year I’m looking forward to learning how to take better pictures and different ways to edit them. The reason this picture is named the way it is, is because most people might be going through a lot either emotionally or physically but yet keep a smile on their face. 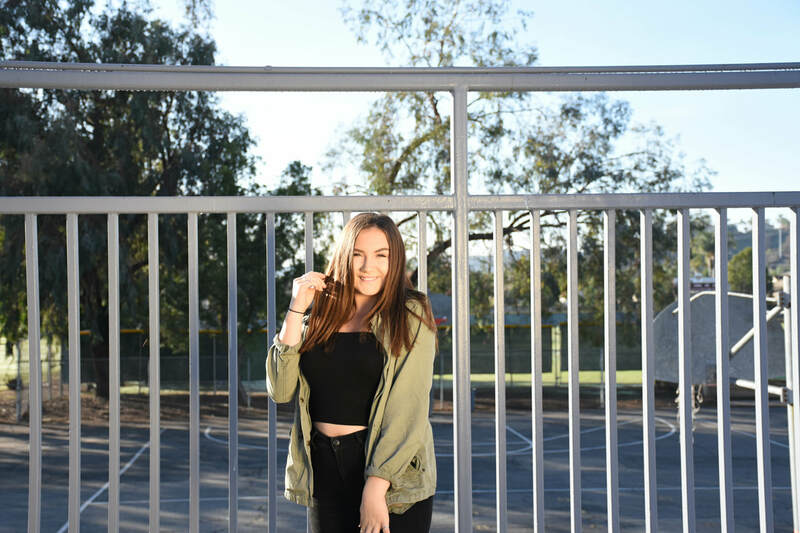 This is a picture of Kirsten Greene, she is a sophomore here at RBV. i used a Canon camera from photography class. This was taken here at the school during one of the times we had to shoot. I like this picture because her skin looks super clear and she looks extremely happy. Also the lighting was really good because the sun was out and shining. I have learned a lot this year from using the camera to knowing what to take pictures of.